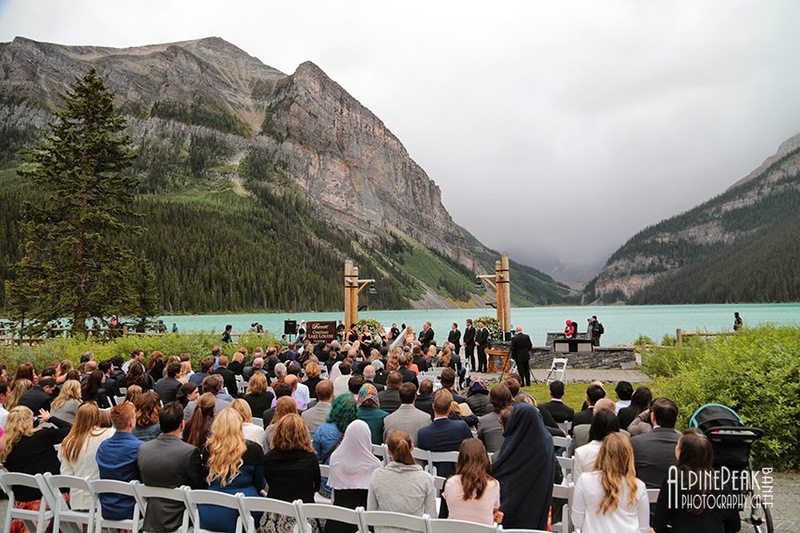 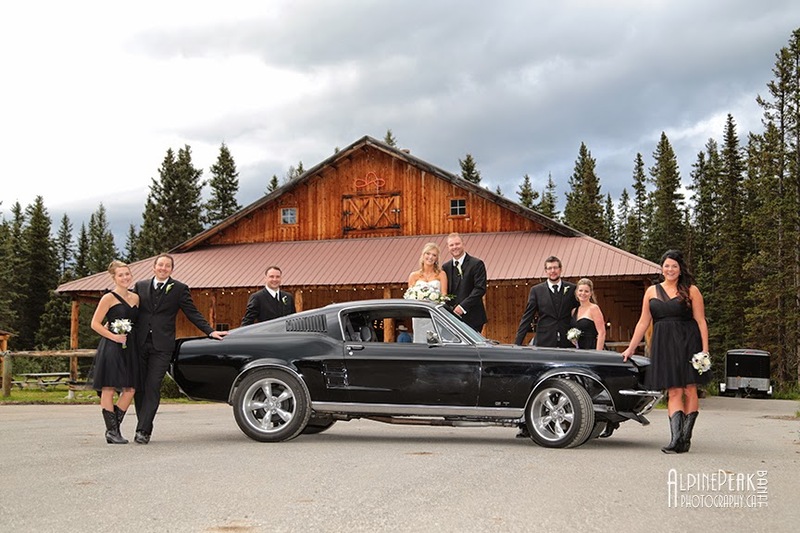 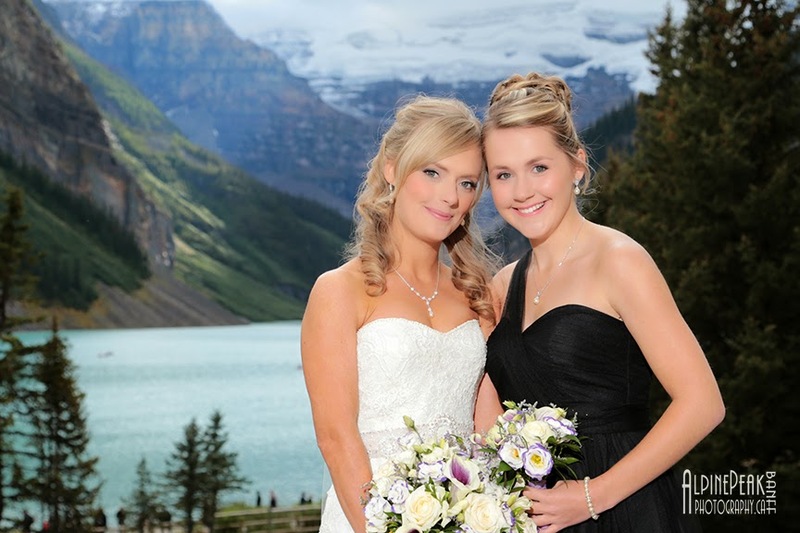 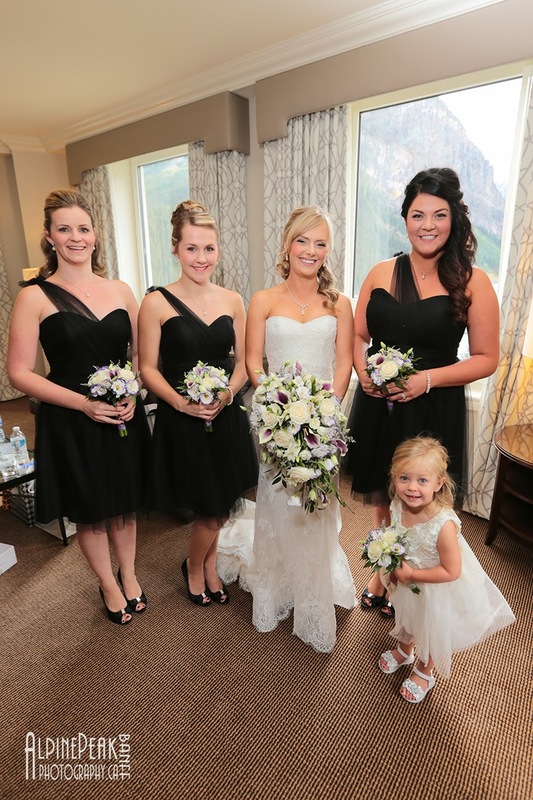 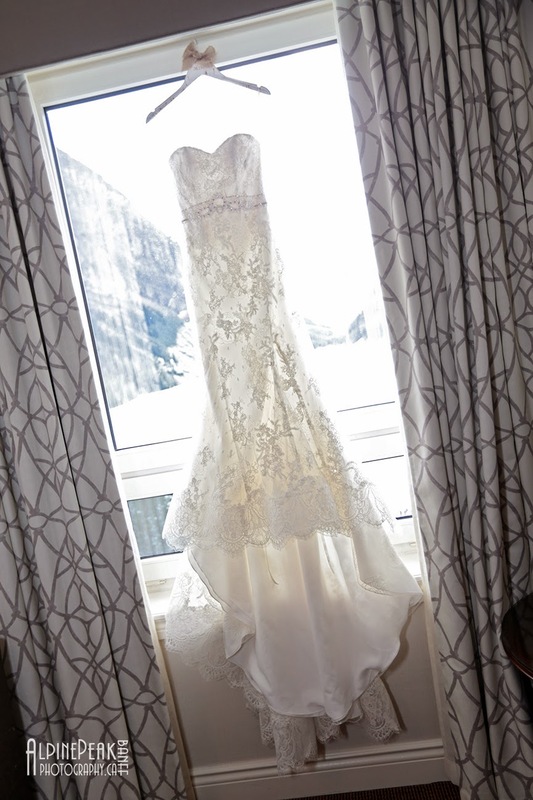 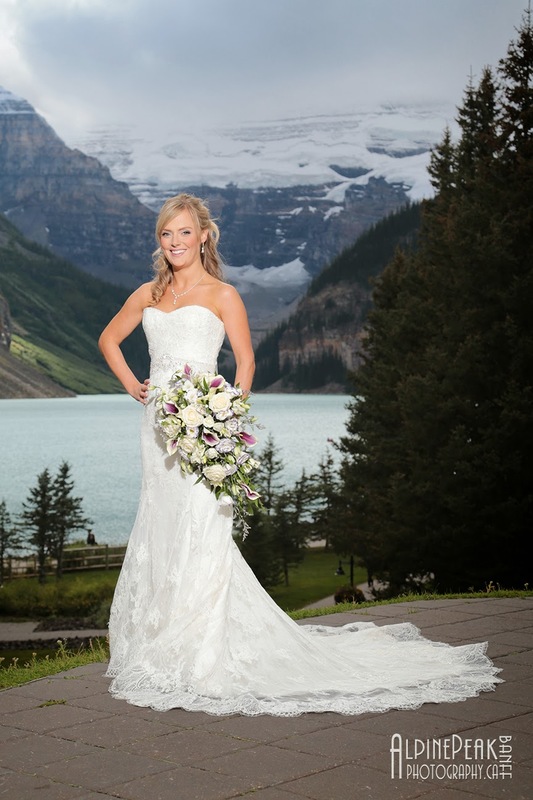 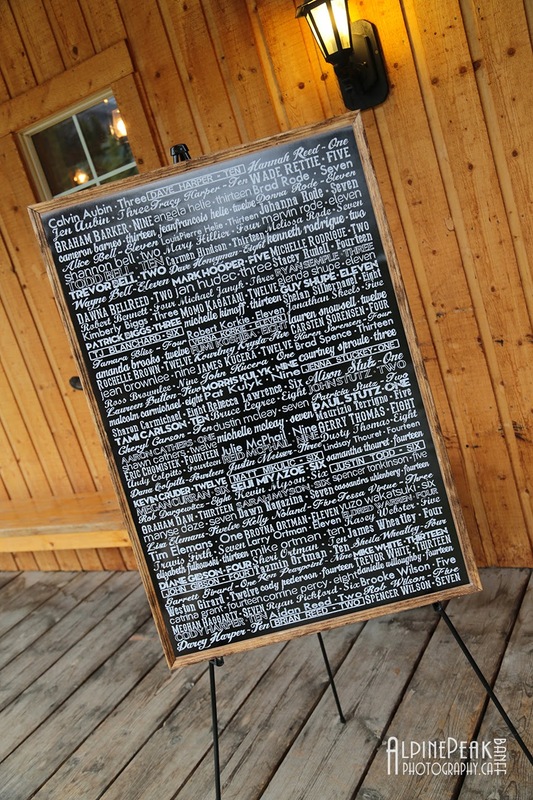 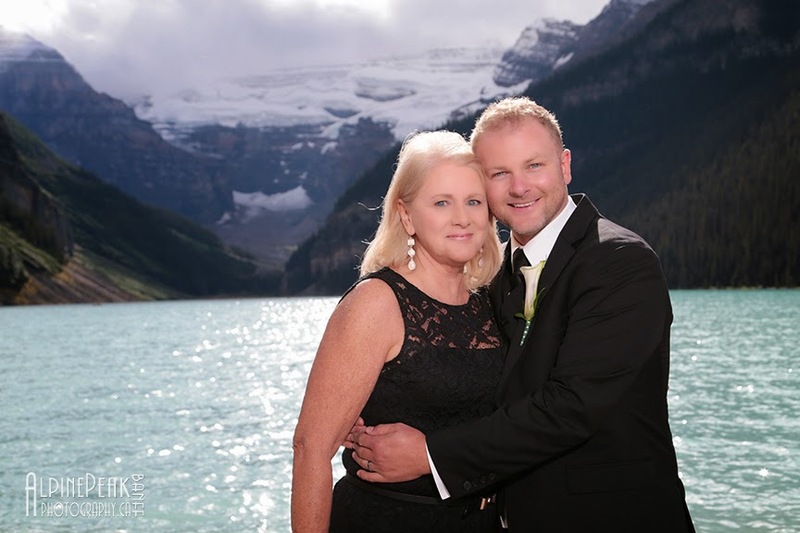 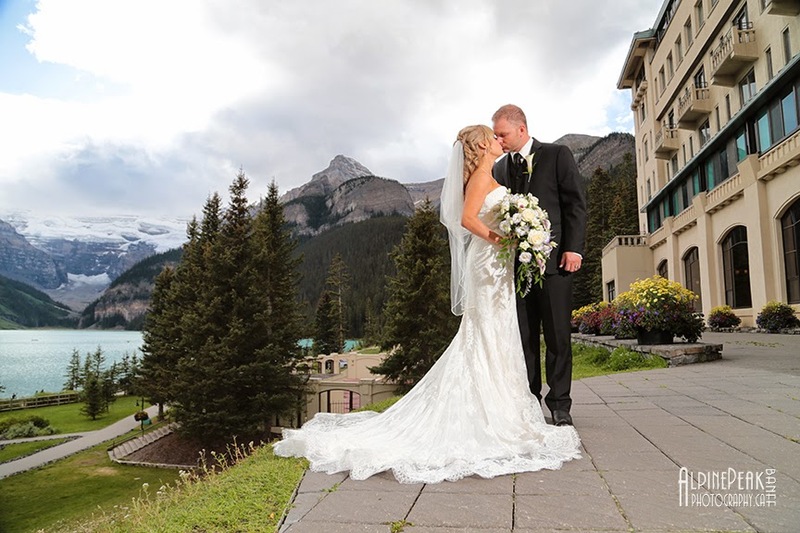 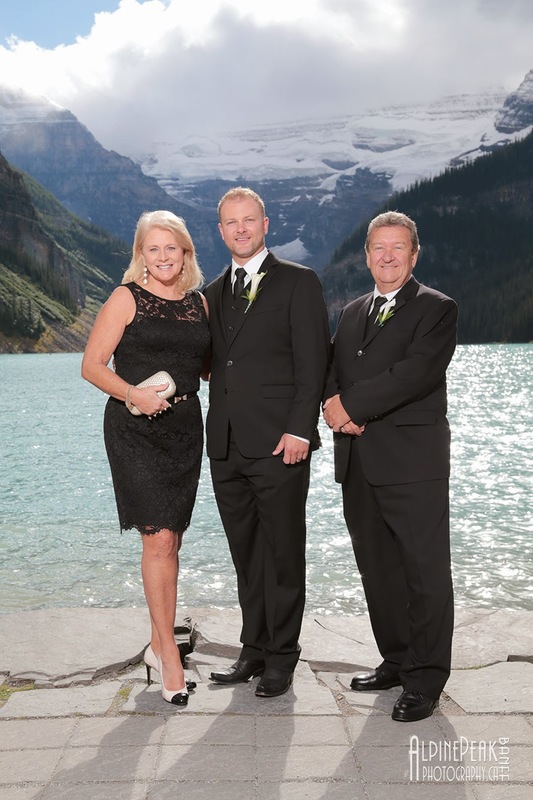 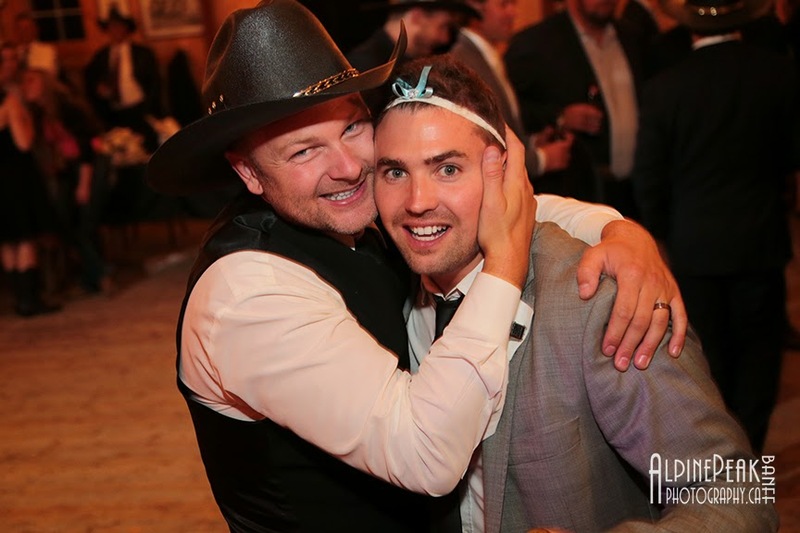 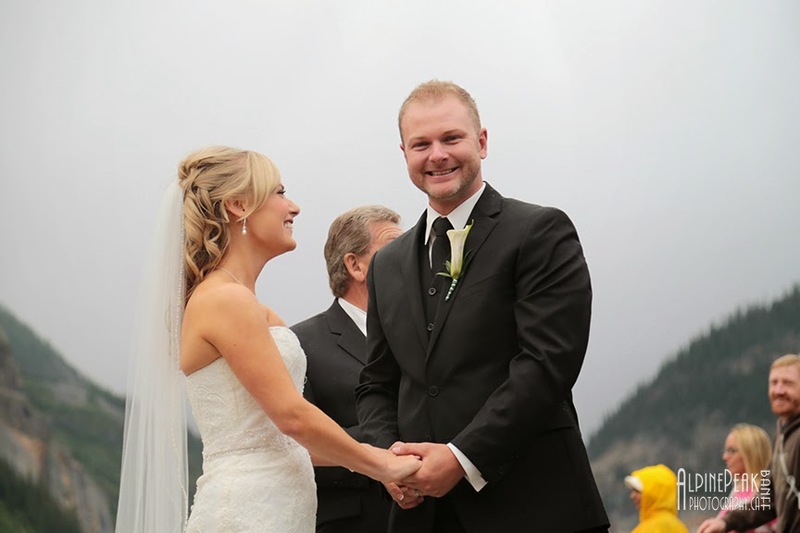 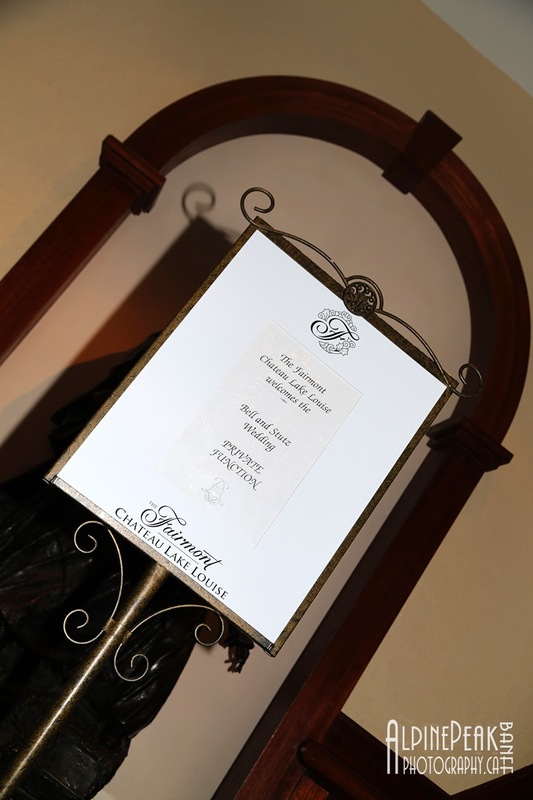 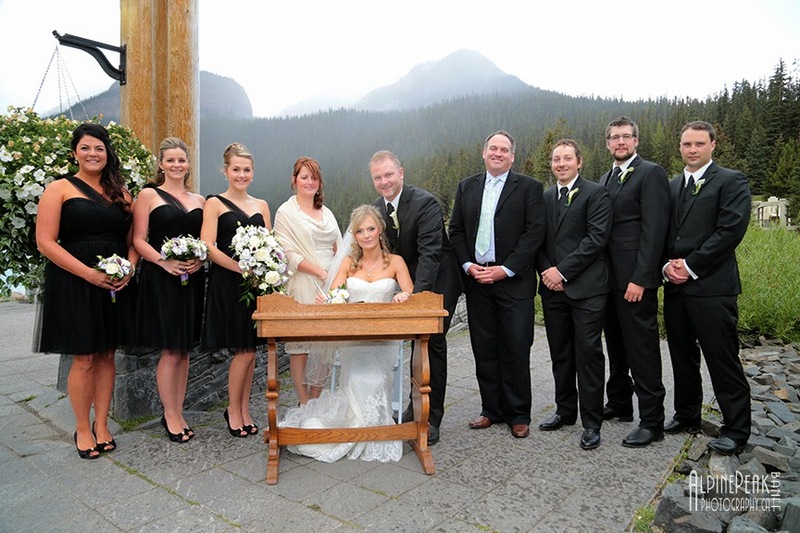 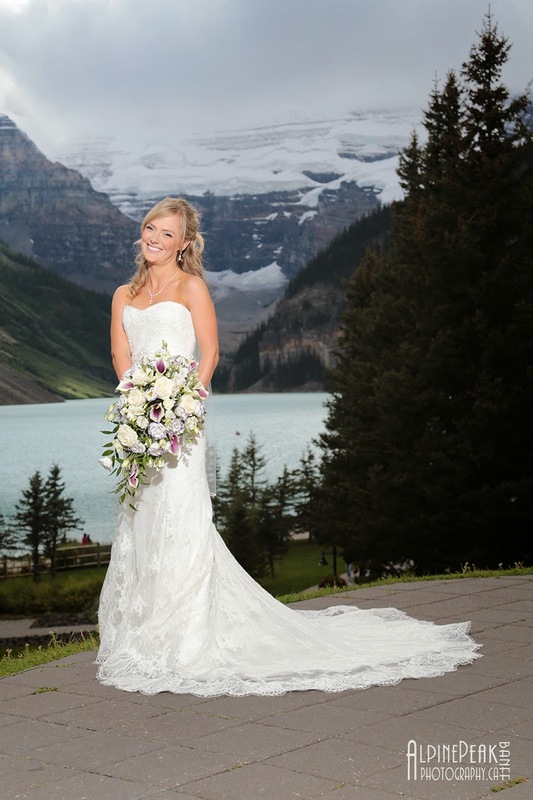 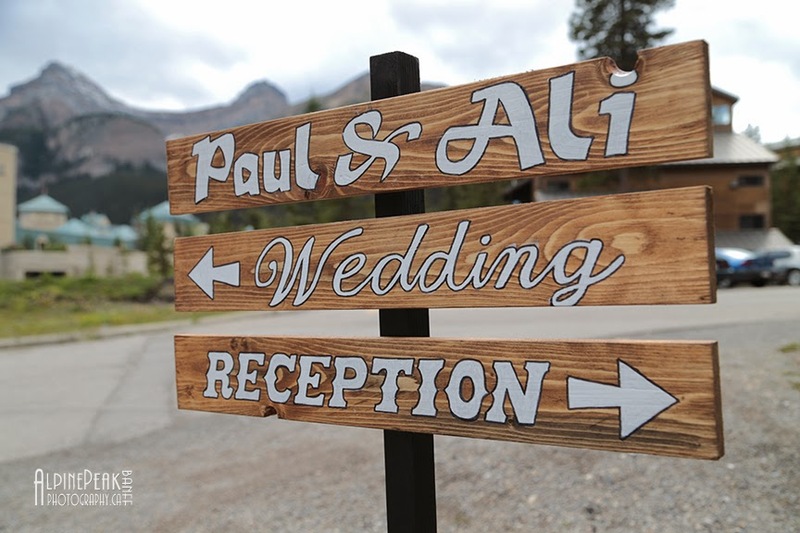 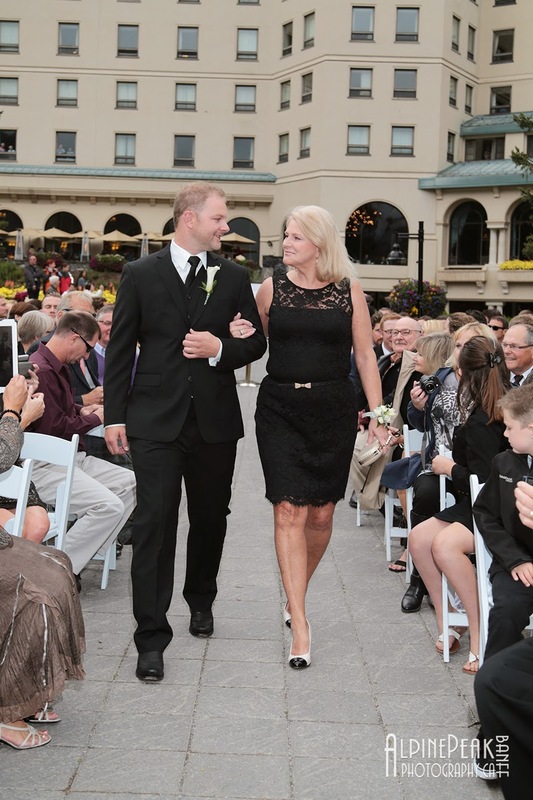 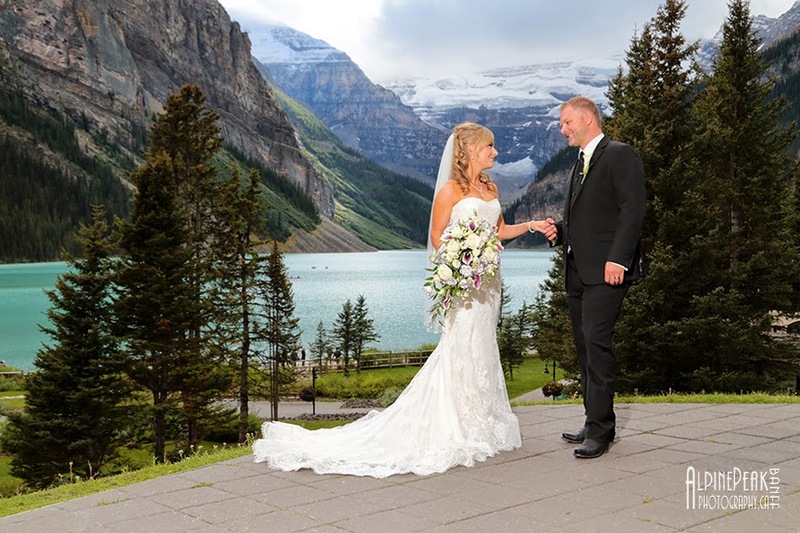 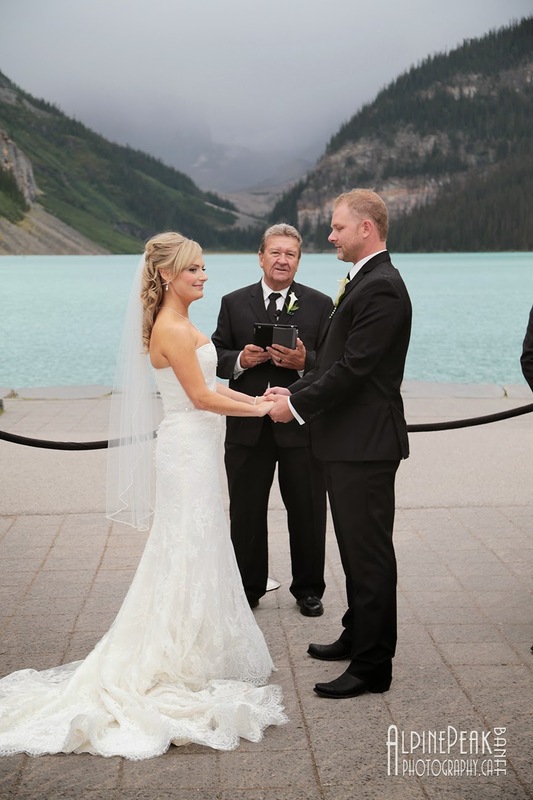 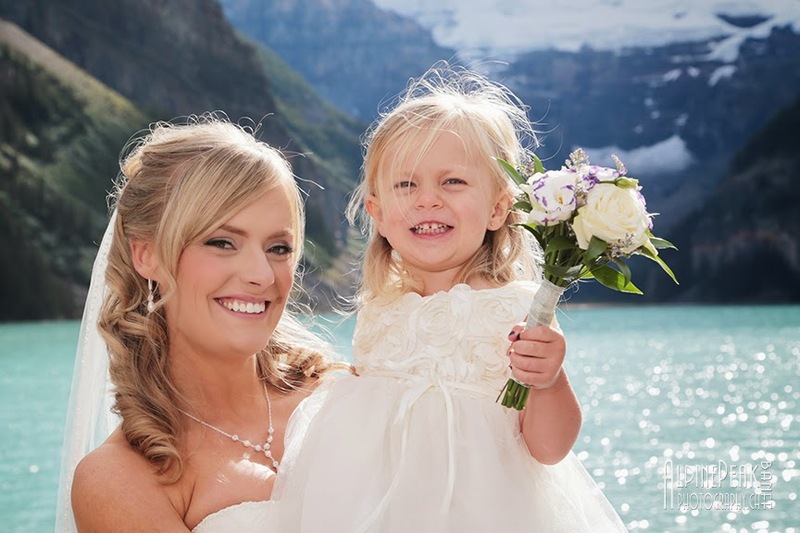 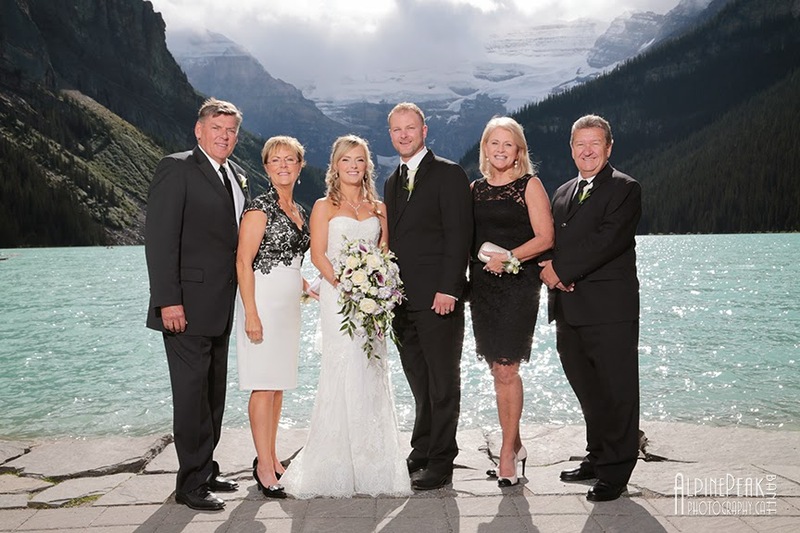 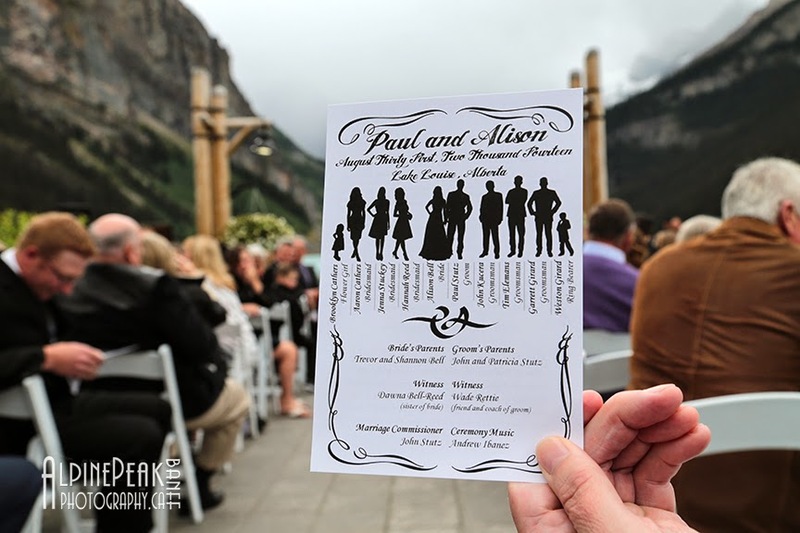 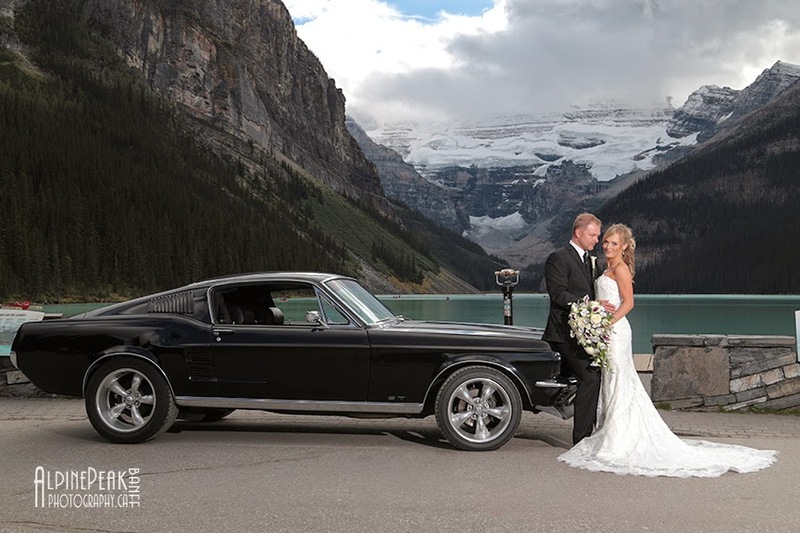 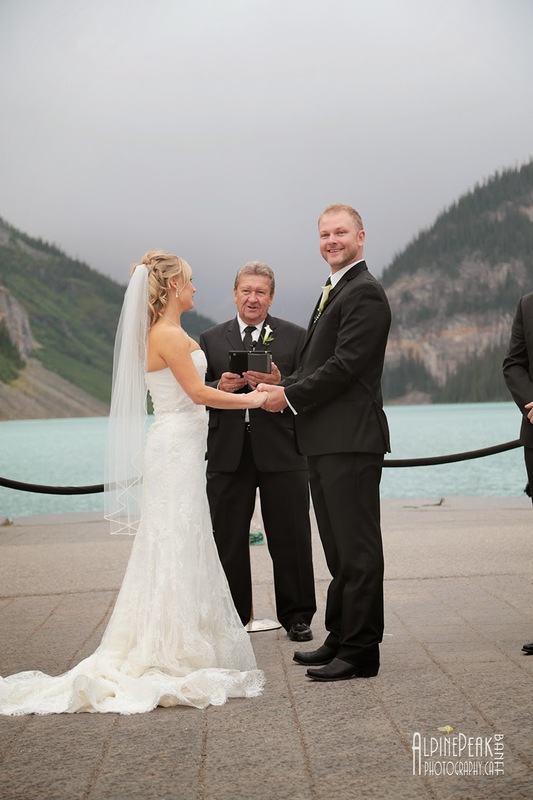 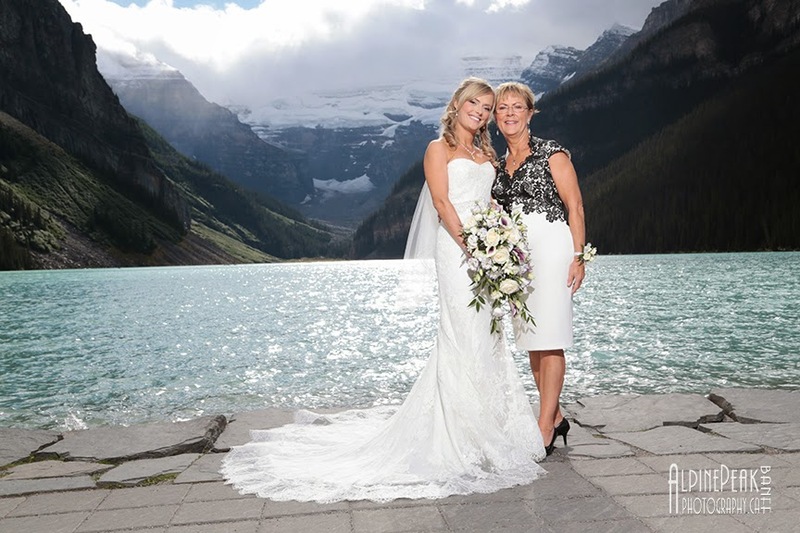 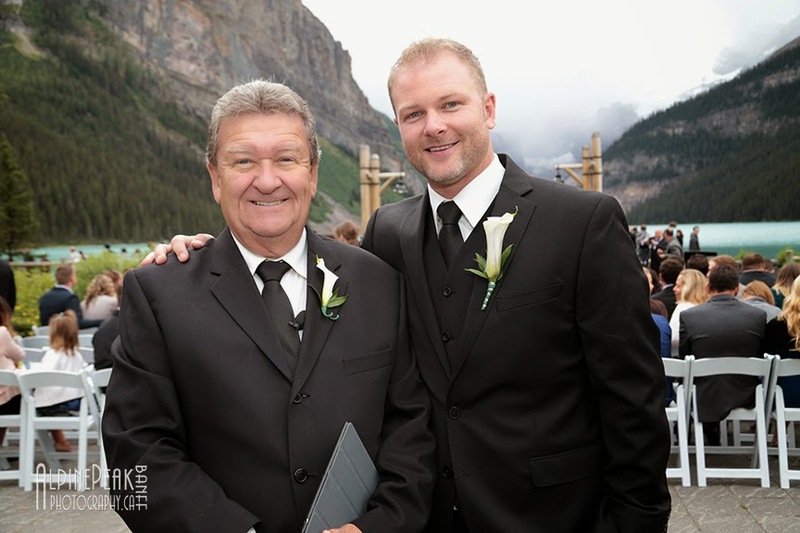 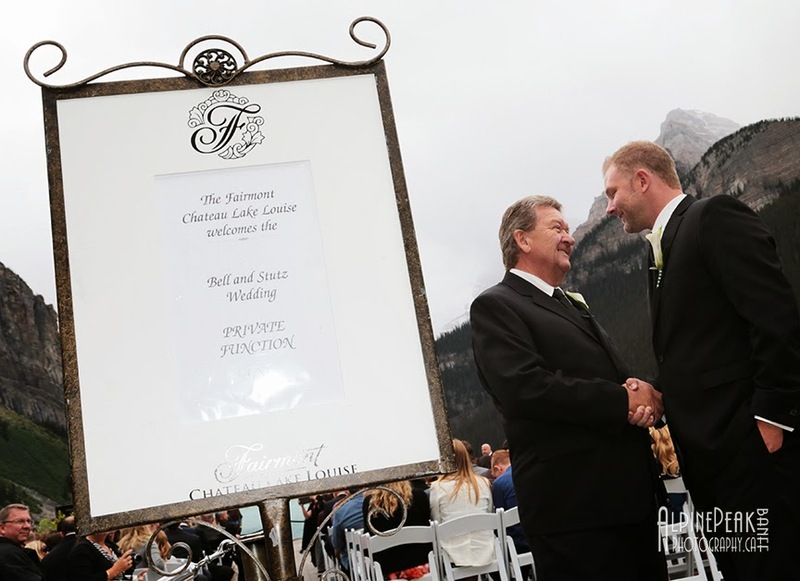 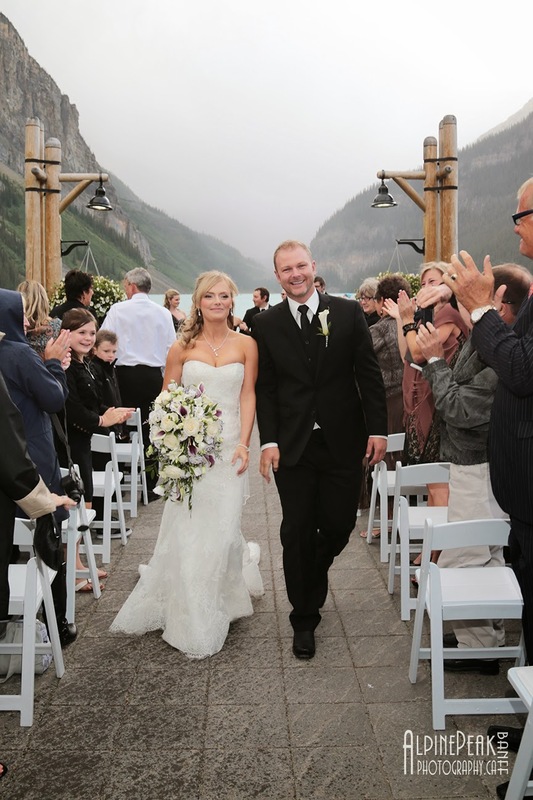 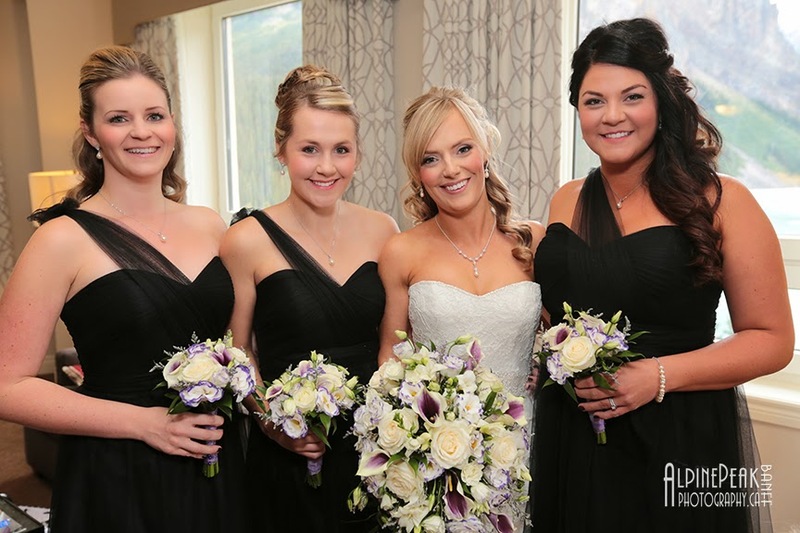 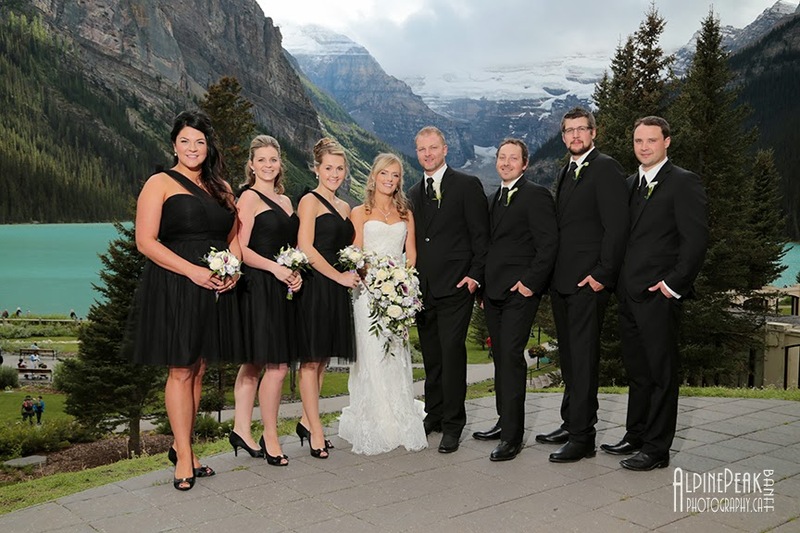 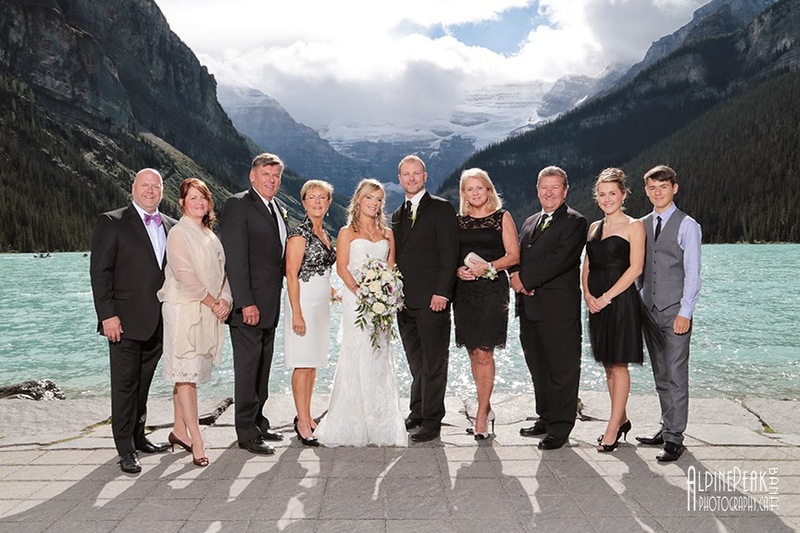 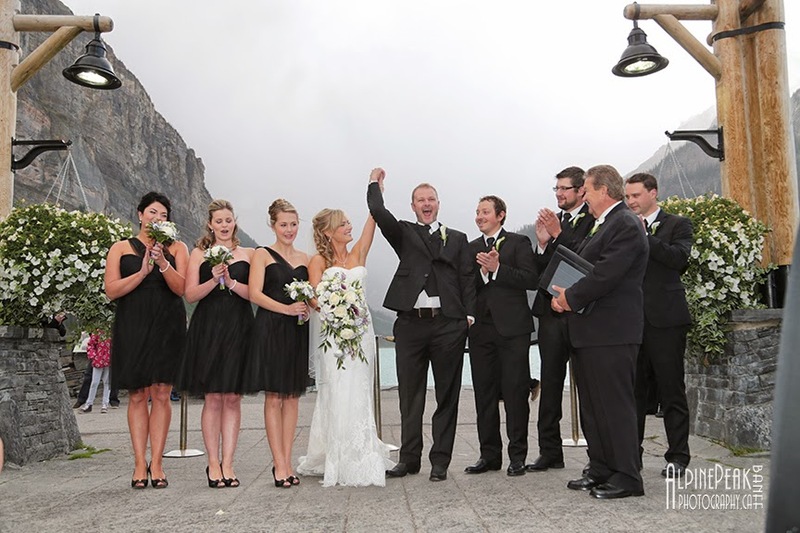 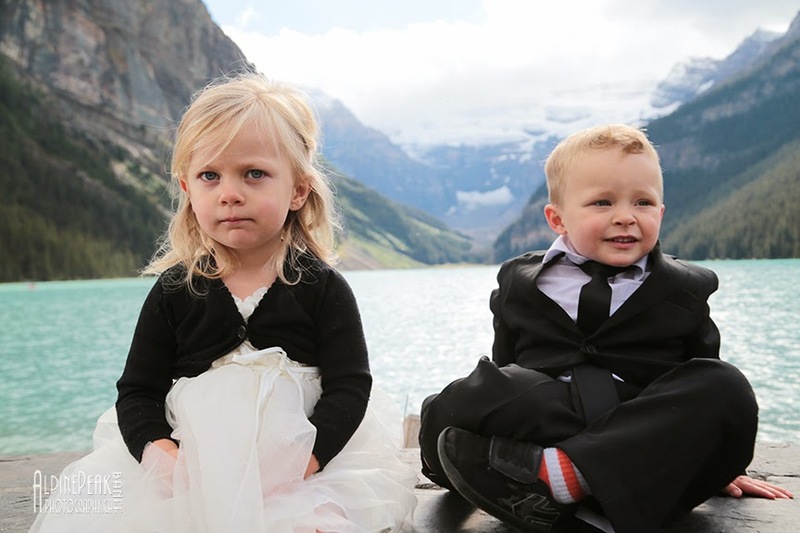 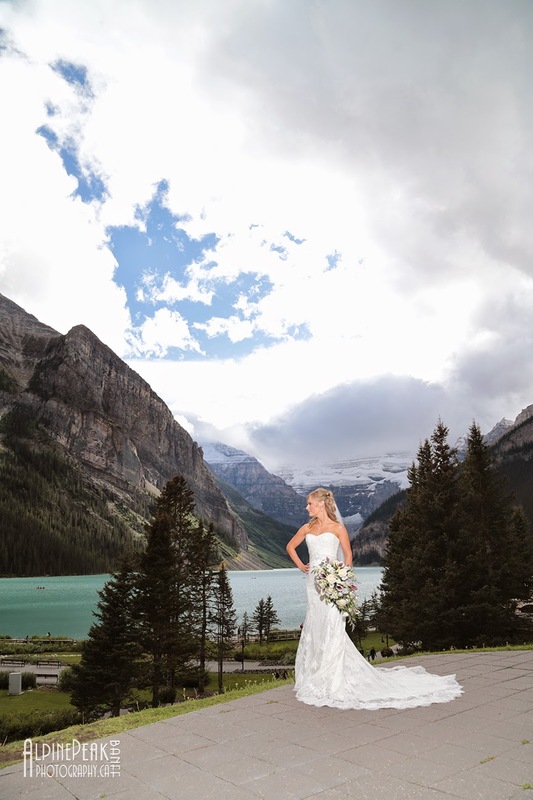 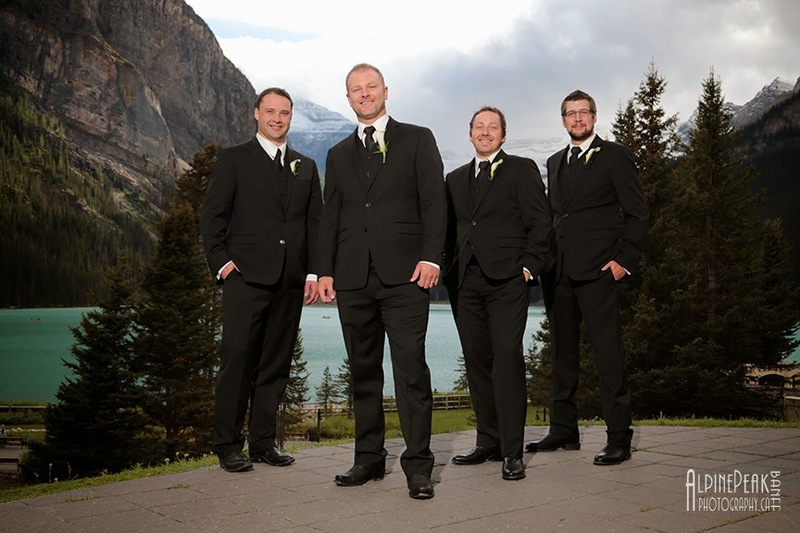 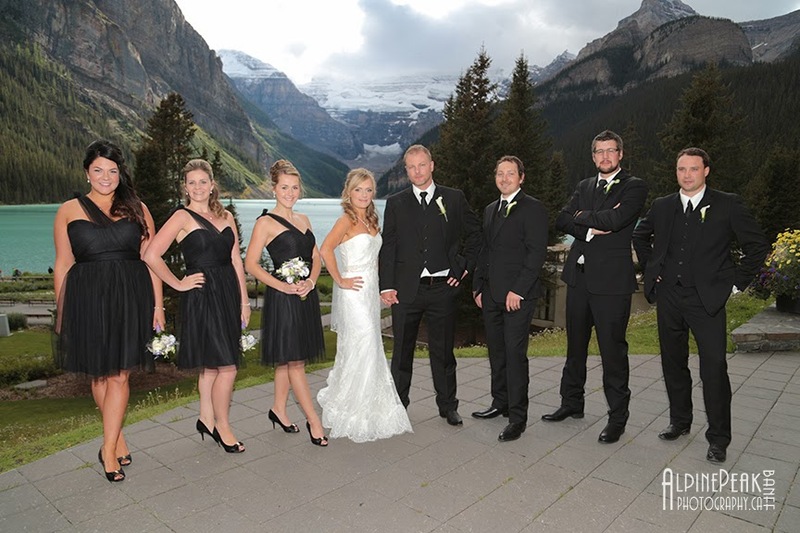 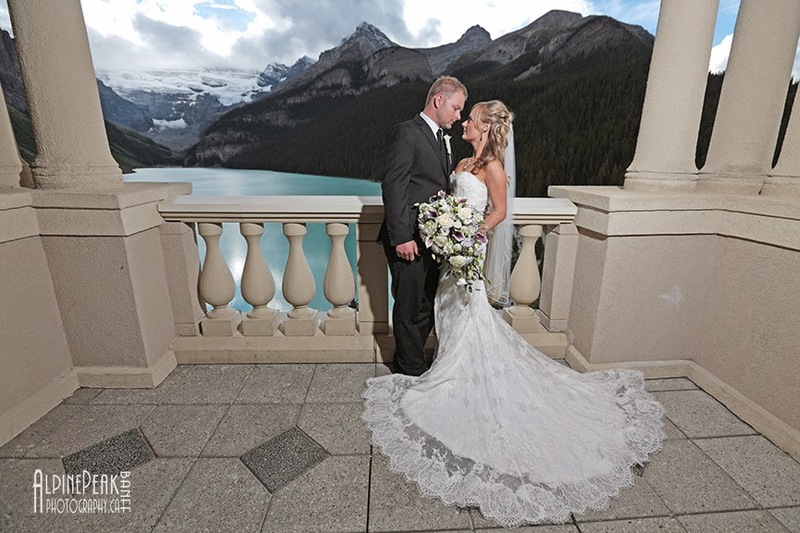 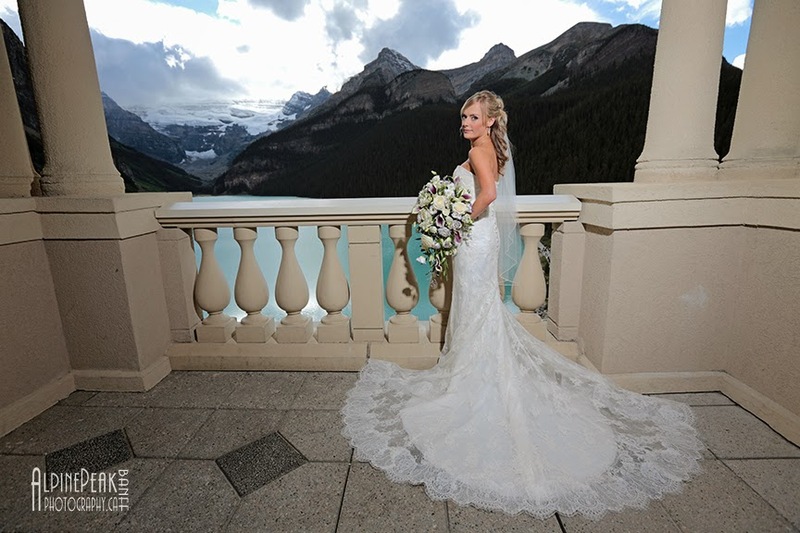 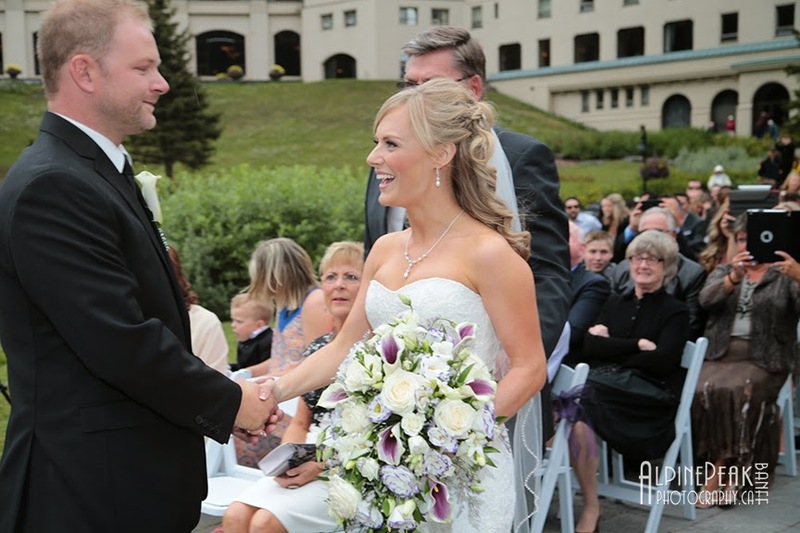 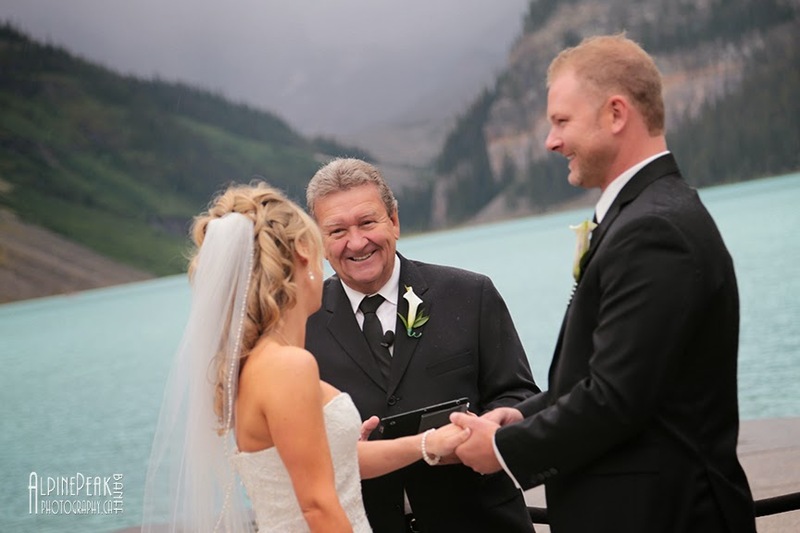 Ali & Paul's incredibly fun wedding at the Fairmont Chateau Lake Louise. 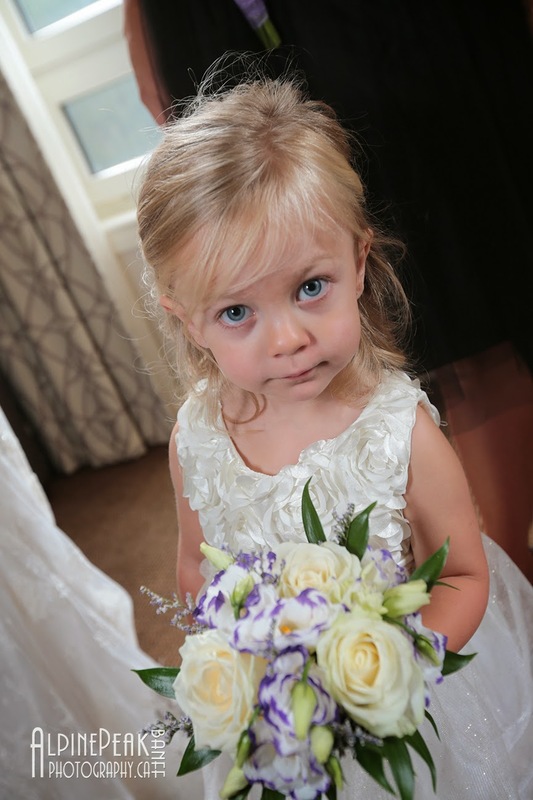 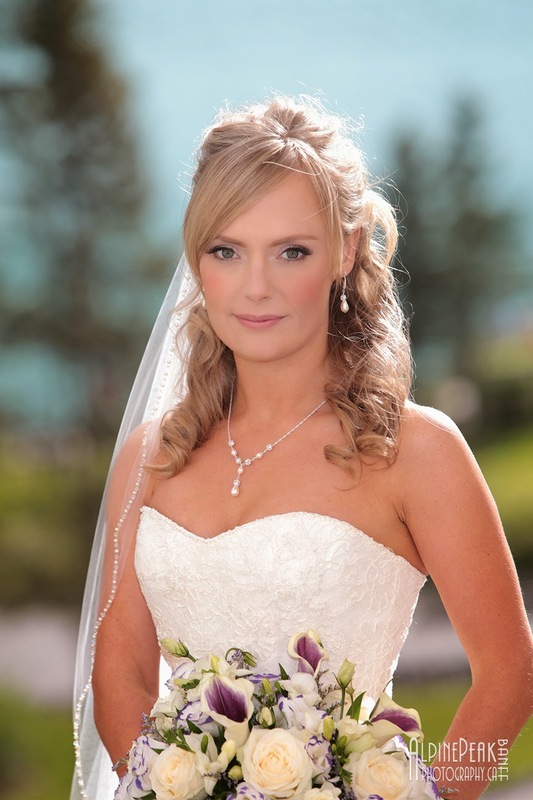 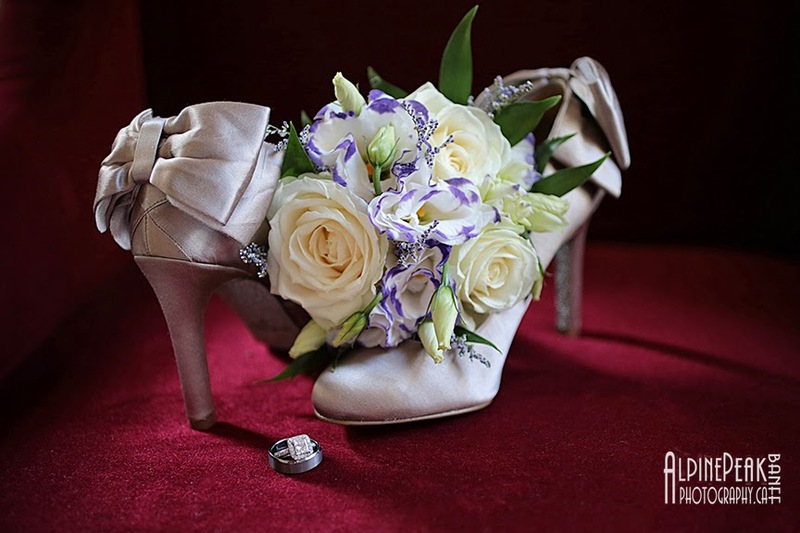 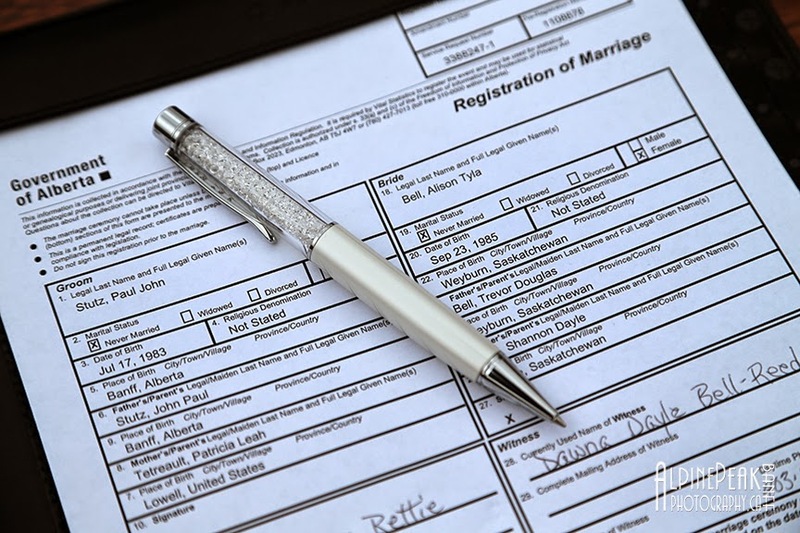 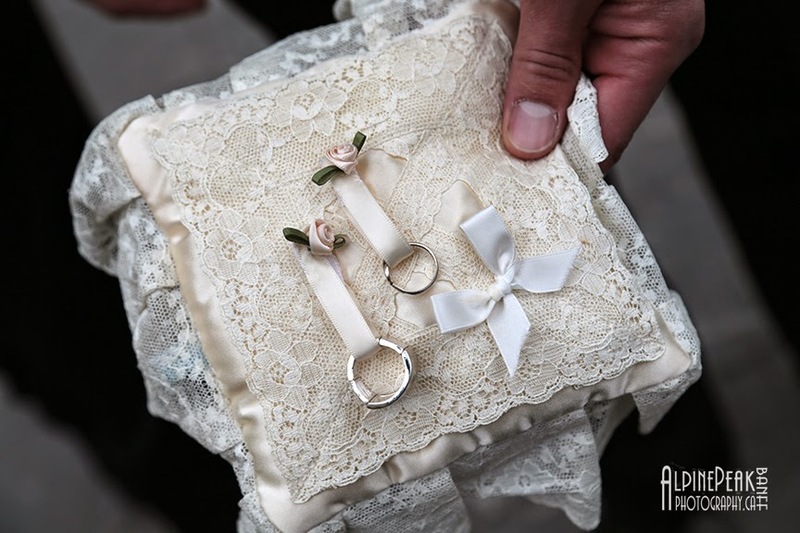 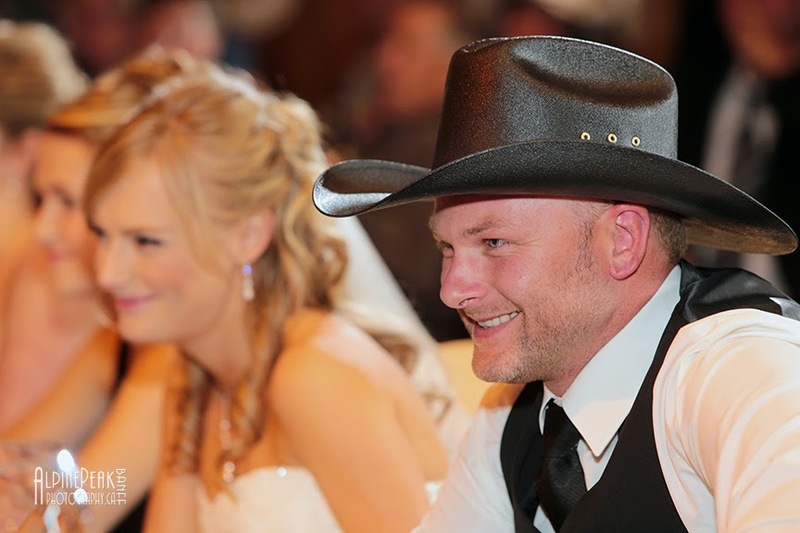 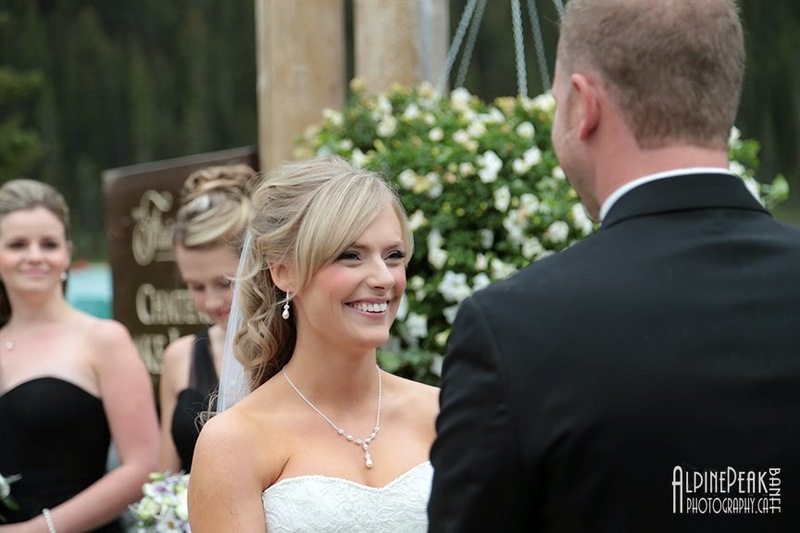 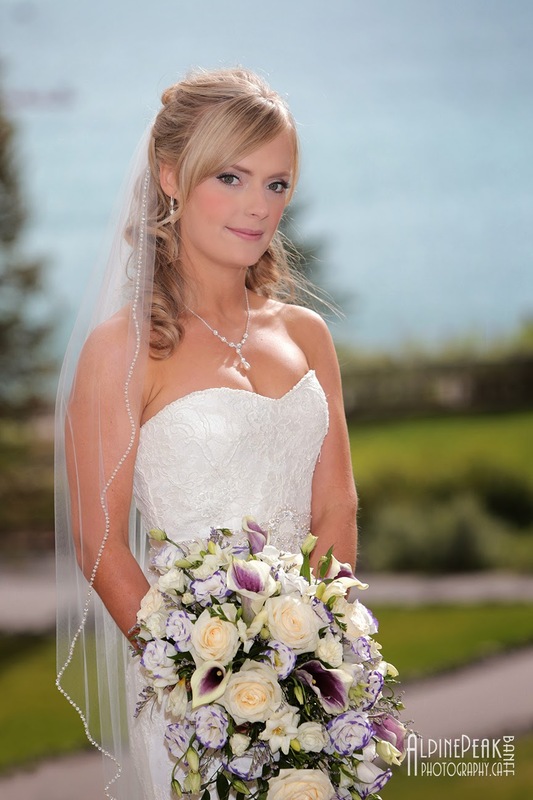 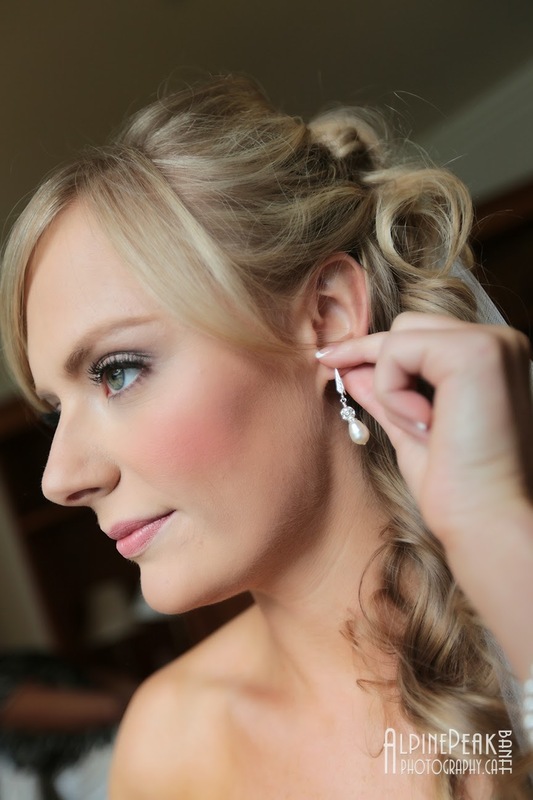 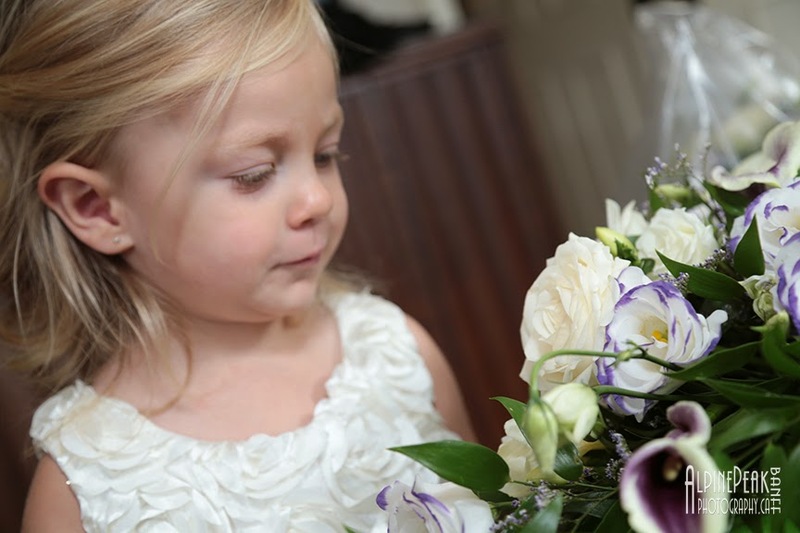 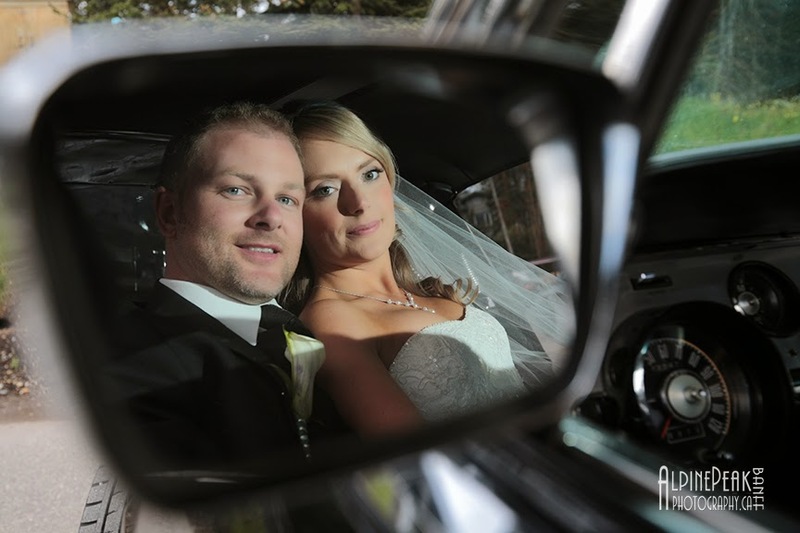 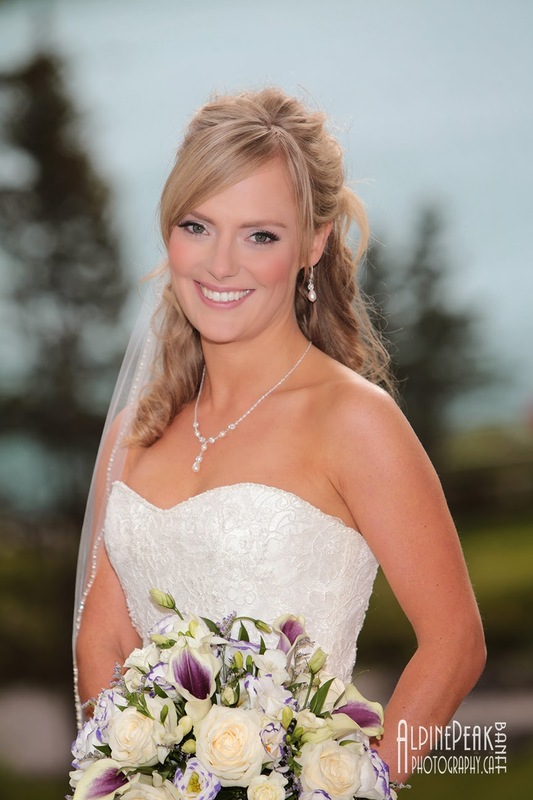 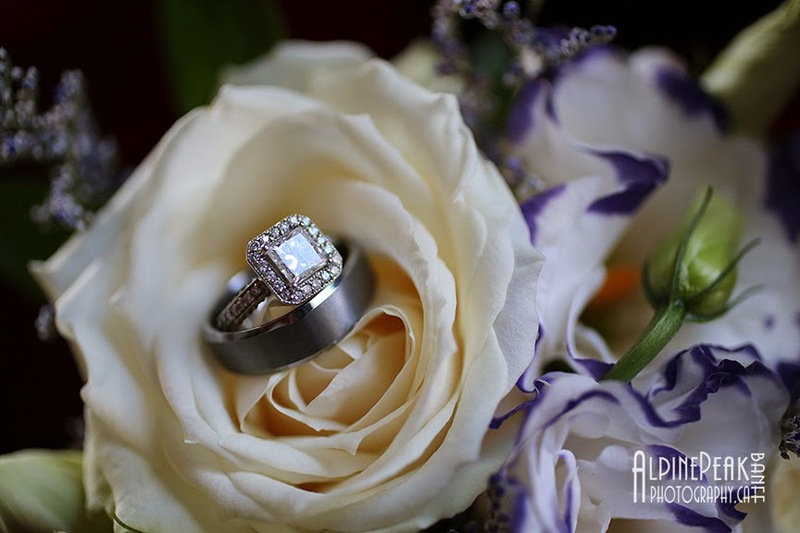 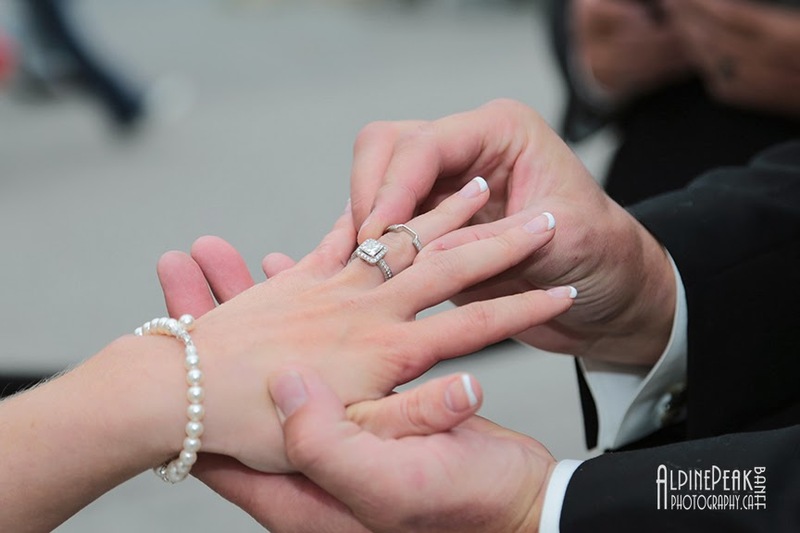 We invite you to enjoy a few images from their beautiful wedding day. 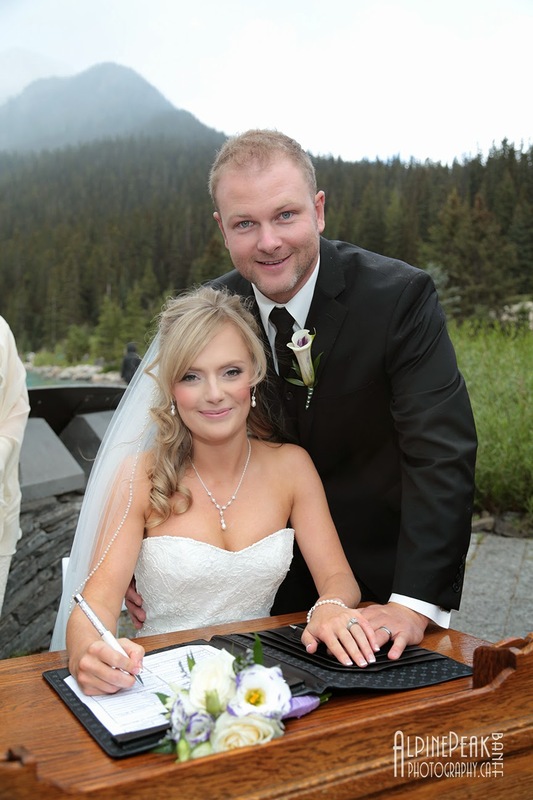 Paul custom designed both wedding rings at Spence Diamond's in Calgary. 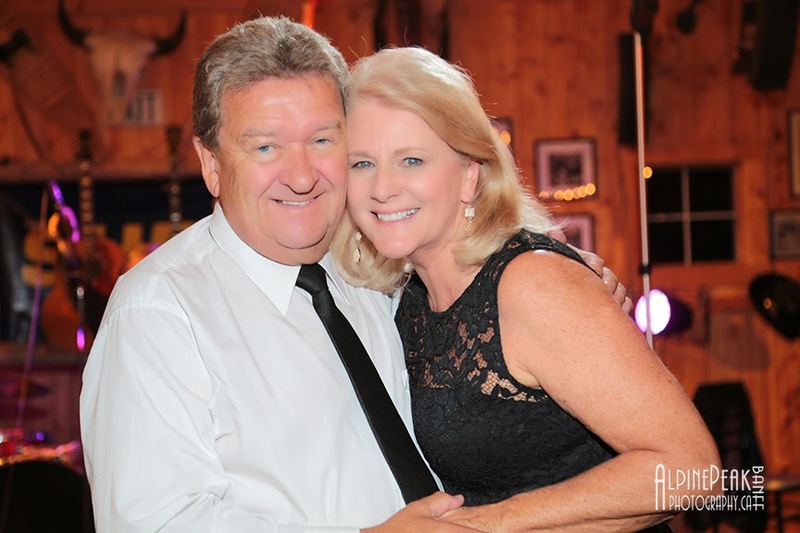 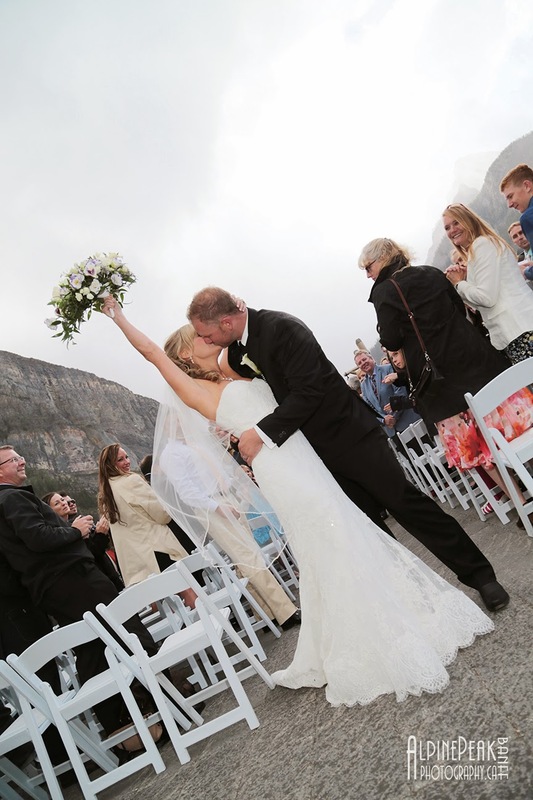 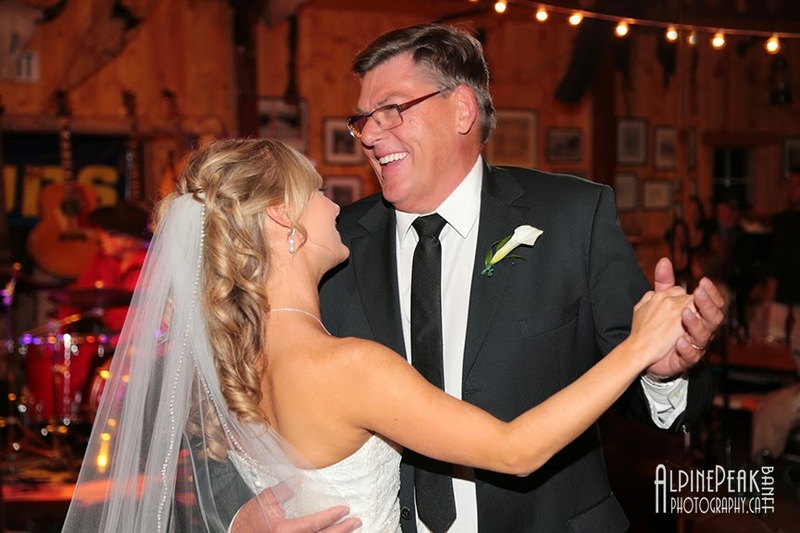 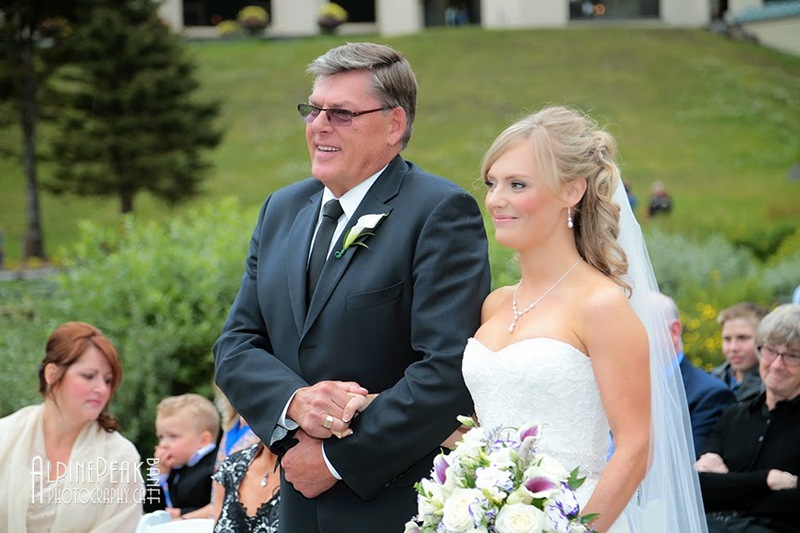 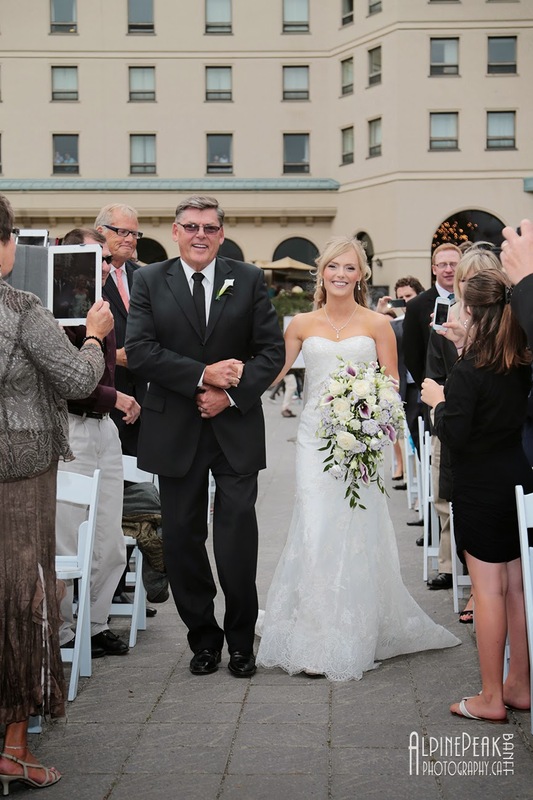 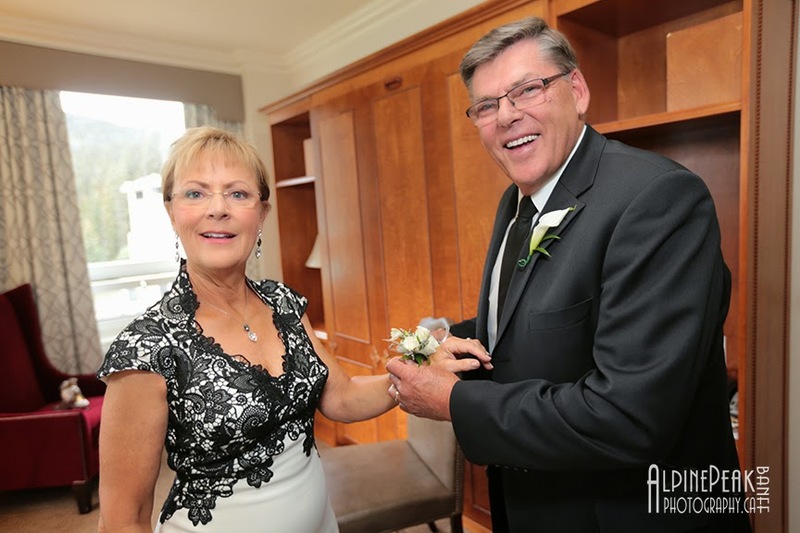 The bride's parents (Shannon & Trevor) enjoyed every moment of Ali & Paul's special day. 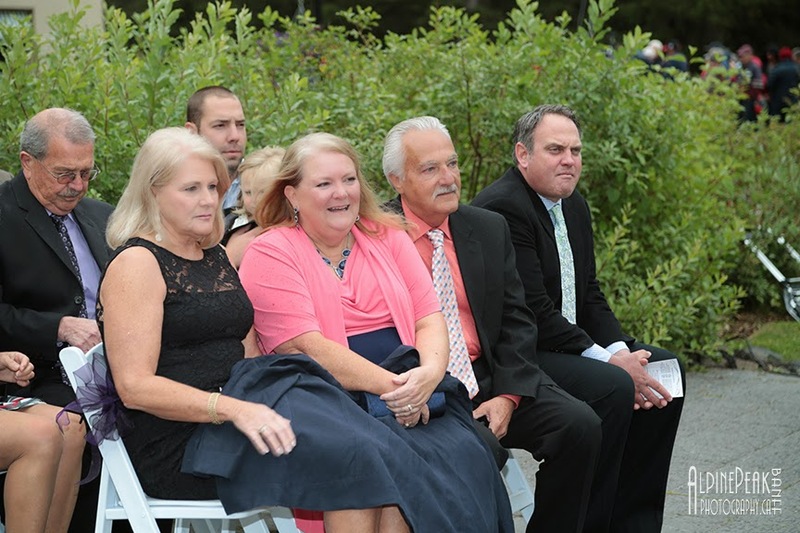 so they could peep out and watch the guests arriving without being spotted. 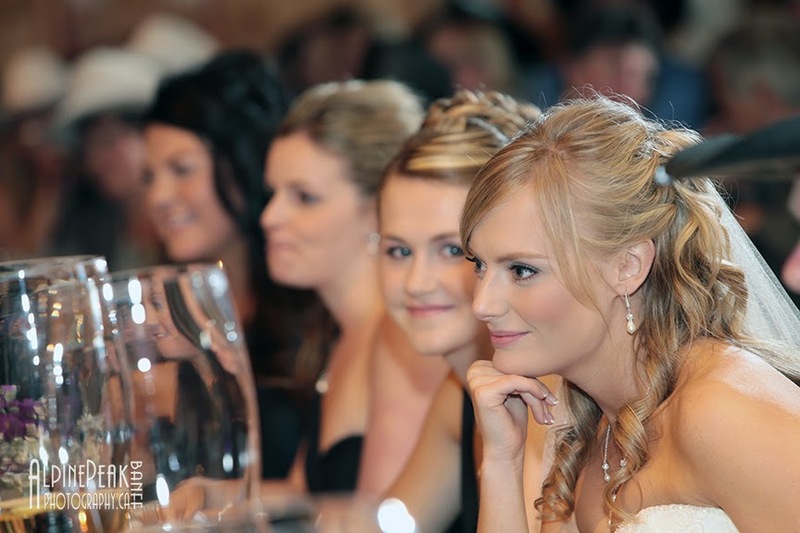 Looking gorgeous, the bride and bridesmaids hair was professionally styled by Brooke and her team at B - Towne, with make up applications by Makeup Artistry. 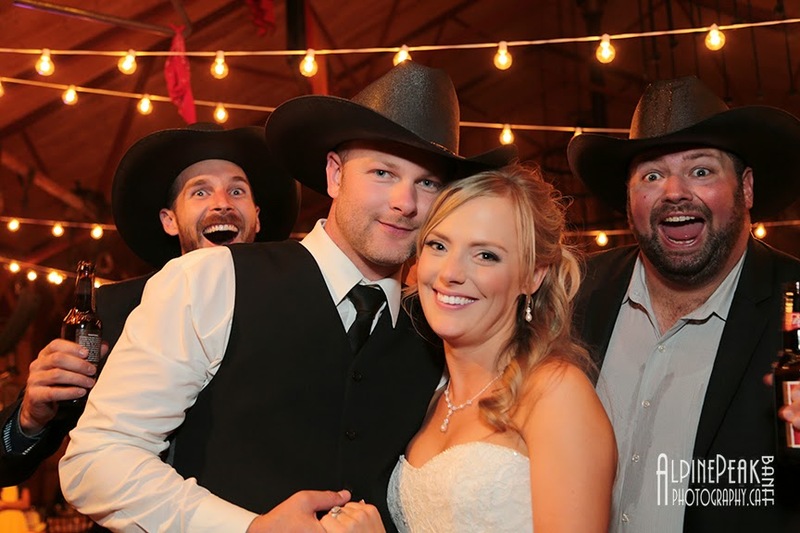 the wedding party down the aisle. 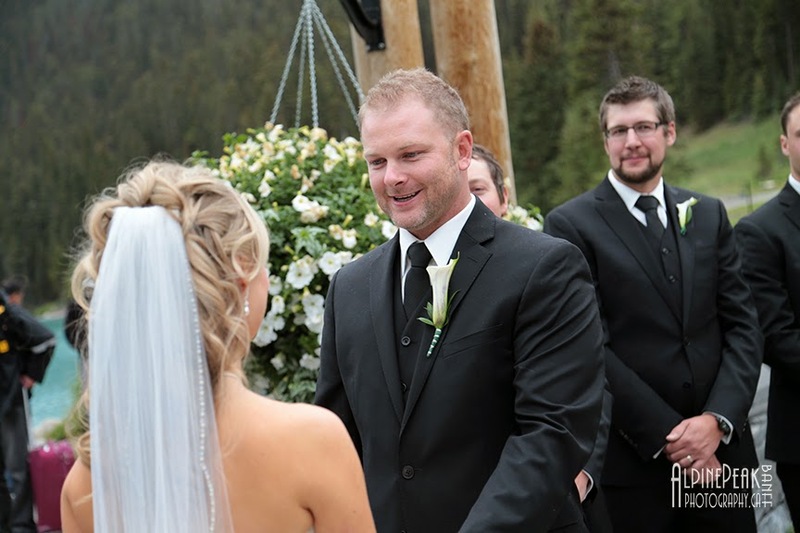 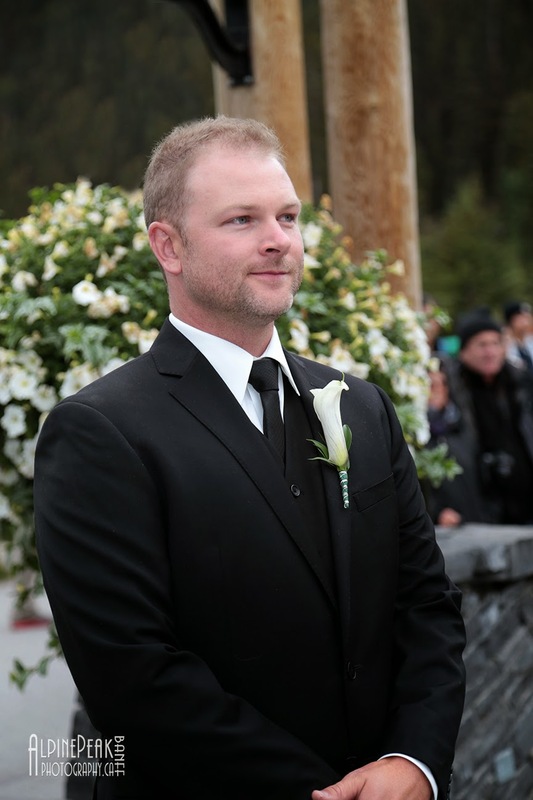 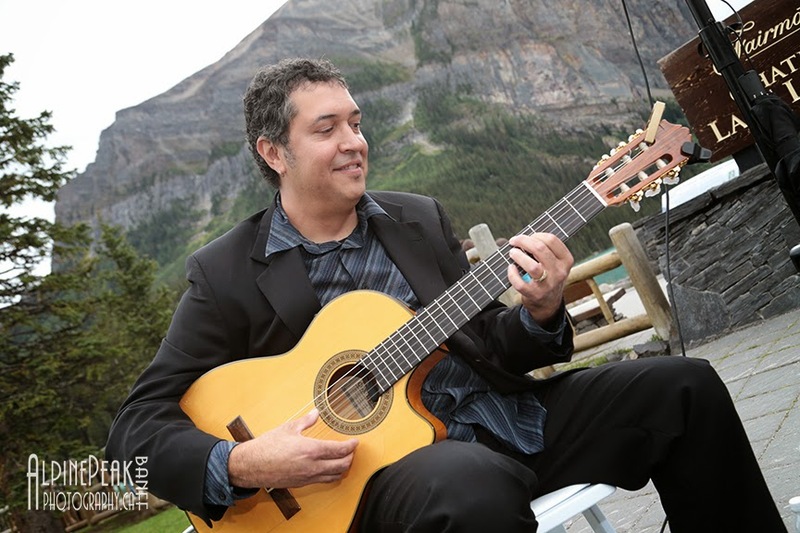 John Stutz performed the wedding ceremony. 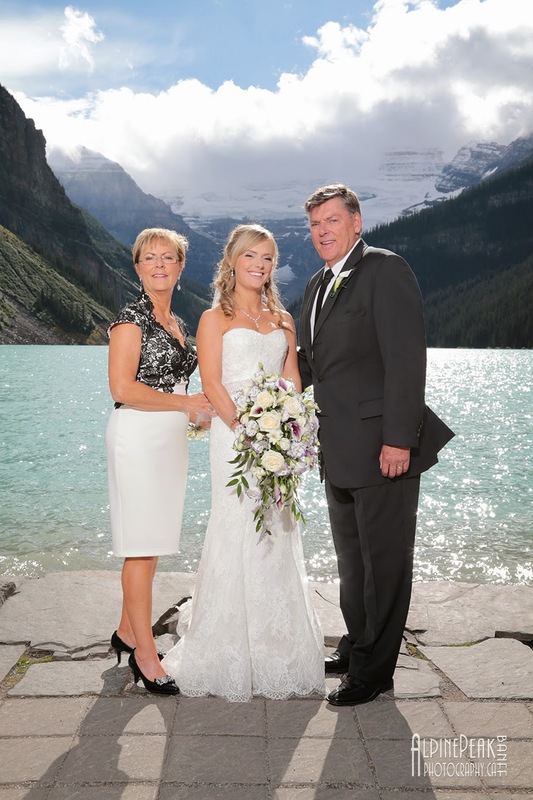 The sun came out for the family photographs providing a beautiful shimmer on the water. 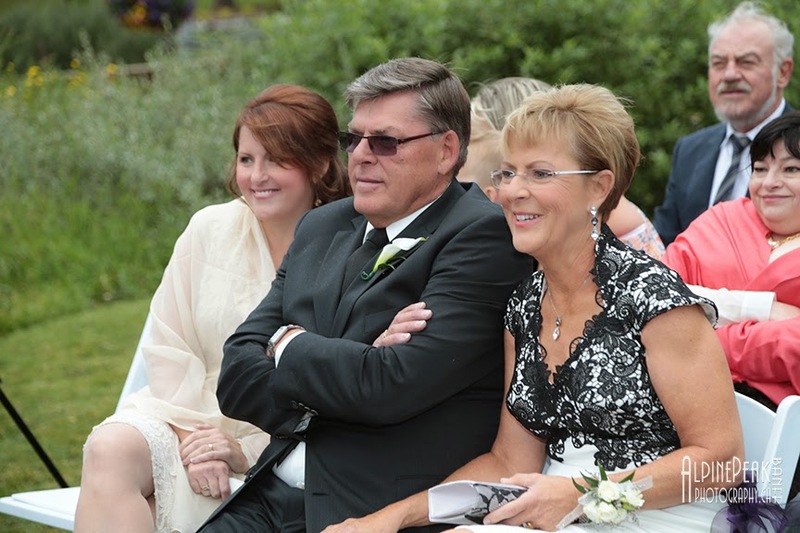 Proud Mom, looking very happy and vibrant. 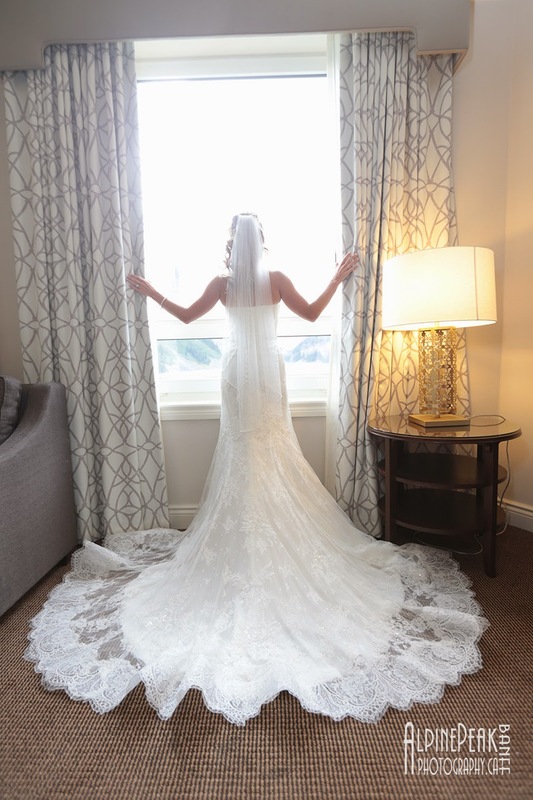 This pose duplicates the image on the wedding program. 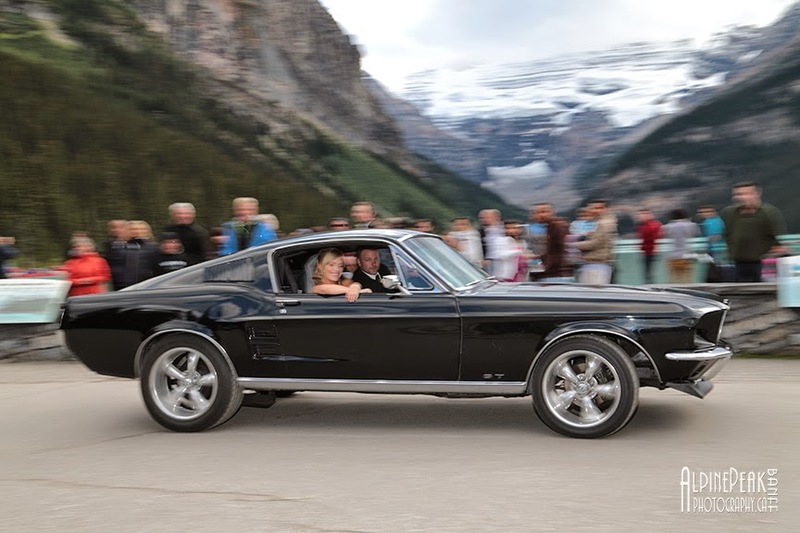 Paul restored his vintage Mustang, and it is his pride and joy next to Ali. 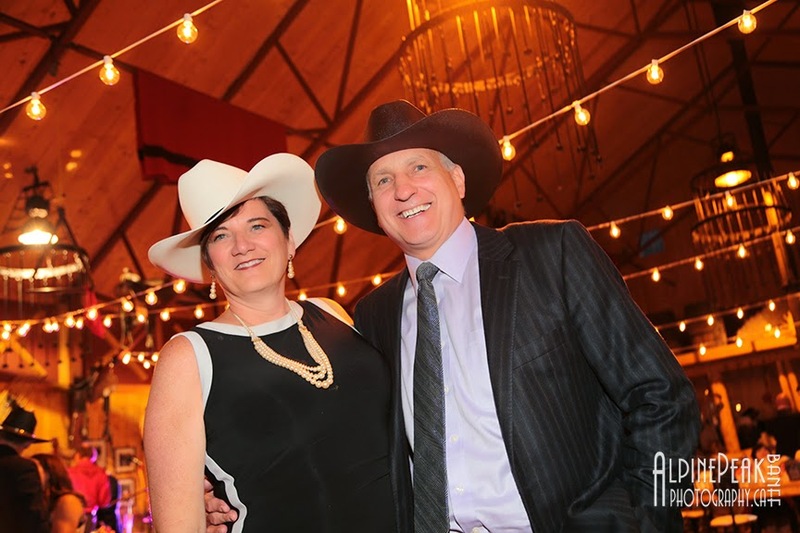 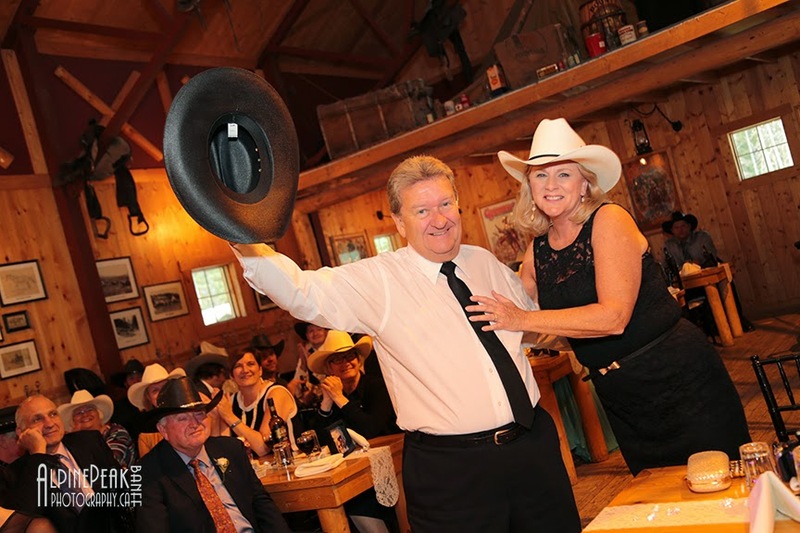 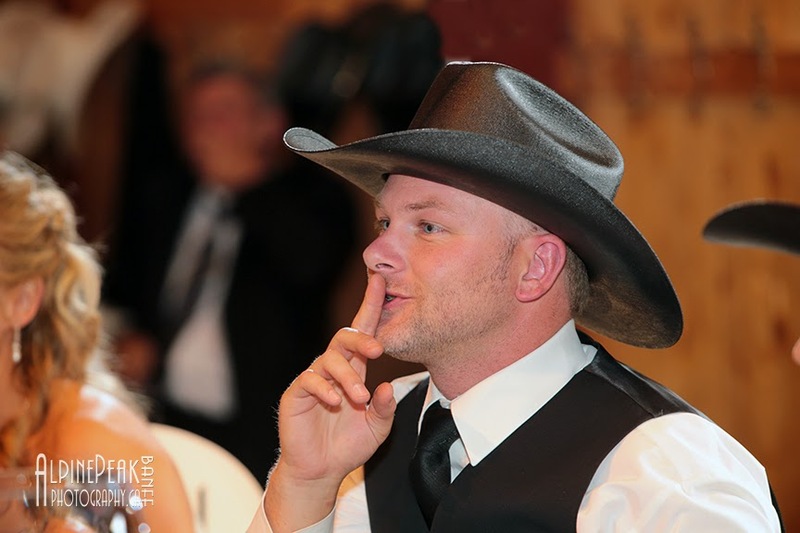 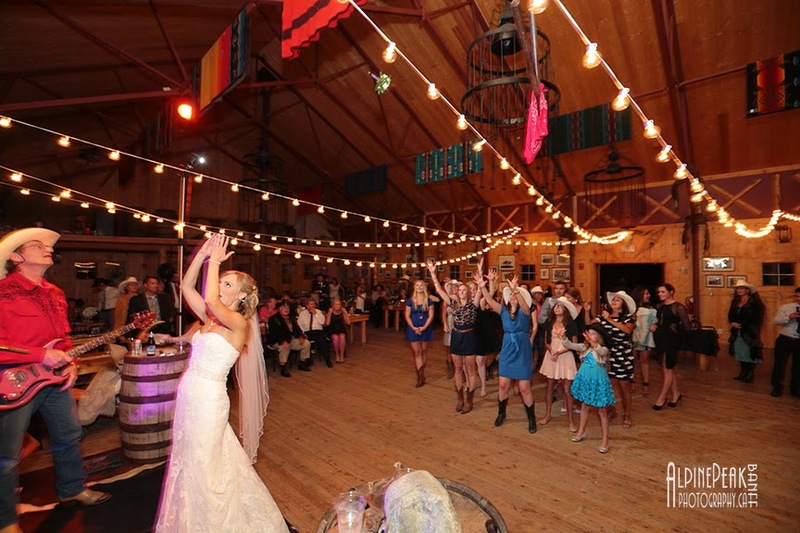 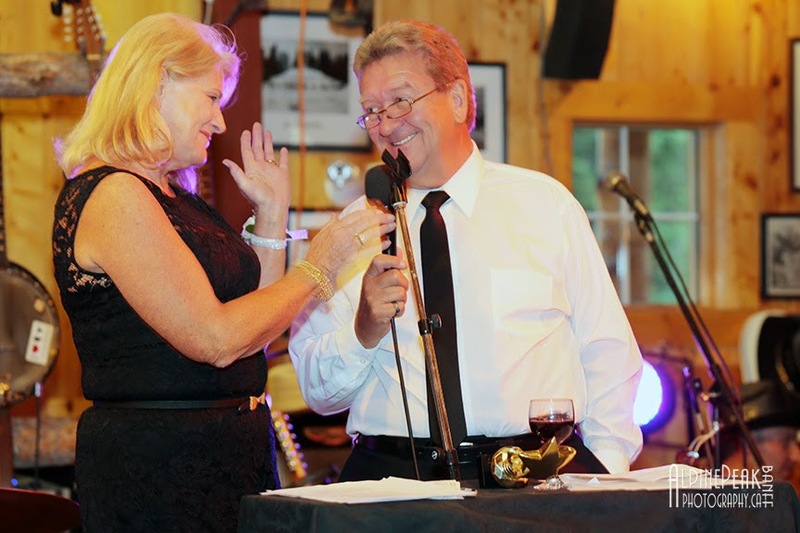 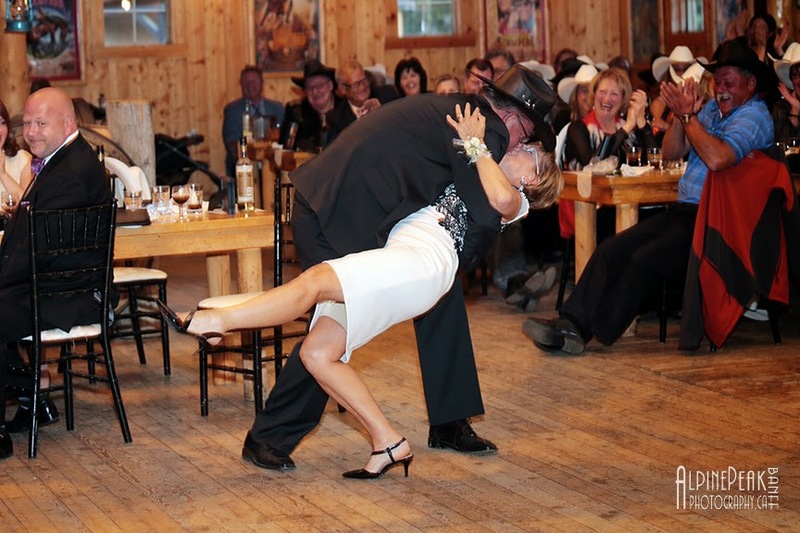 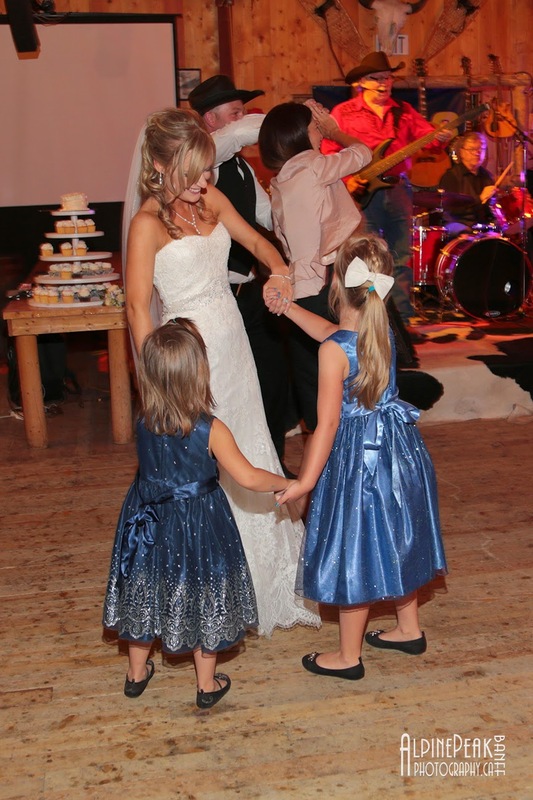 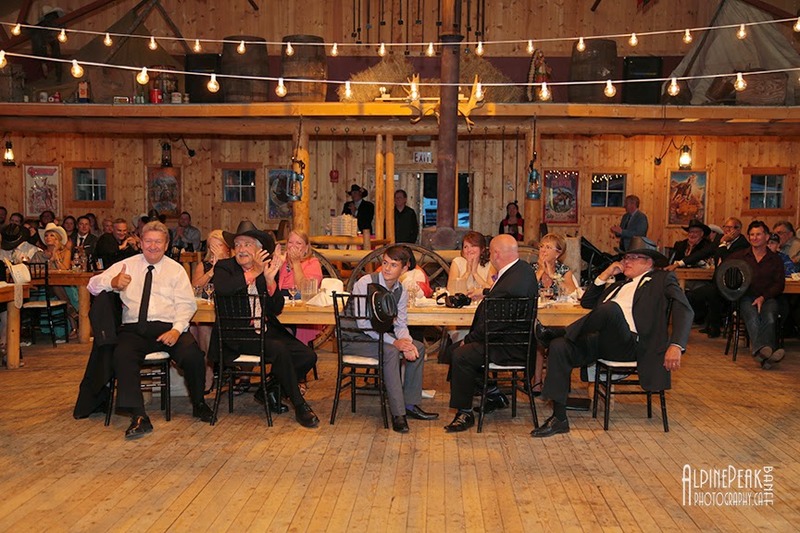 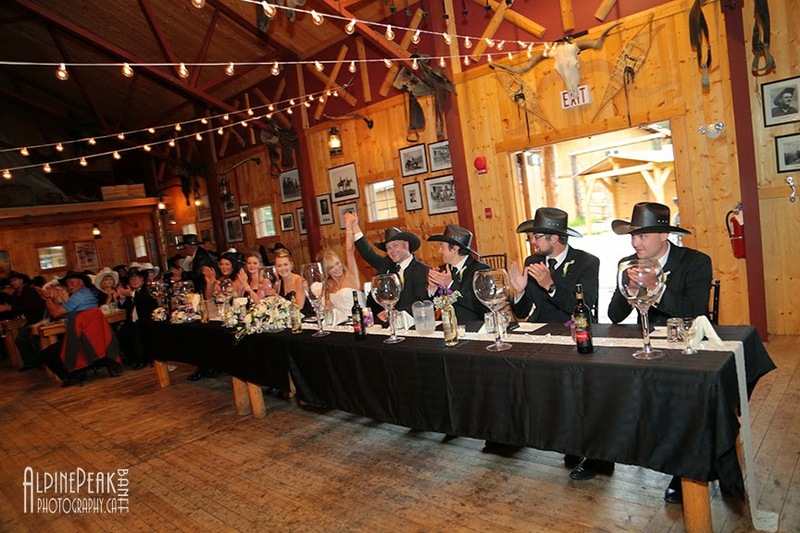 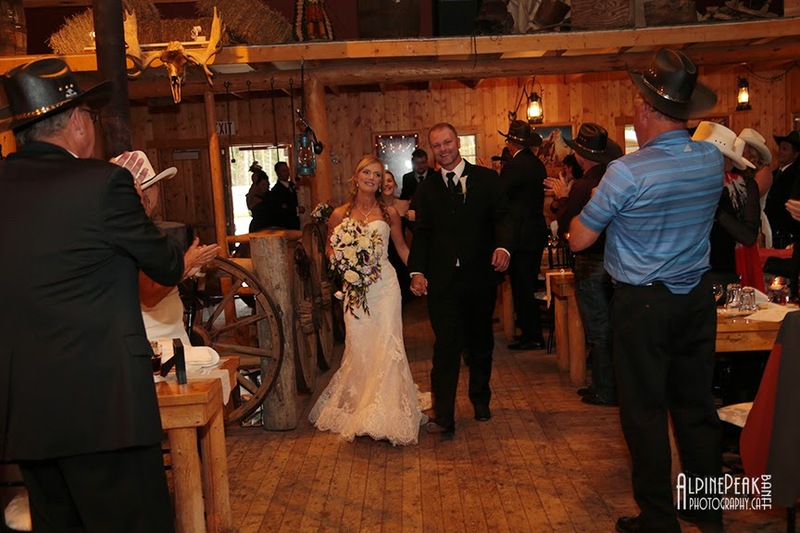 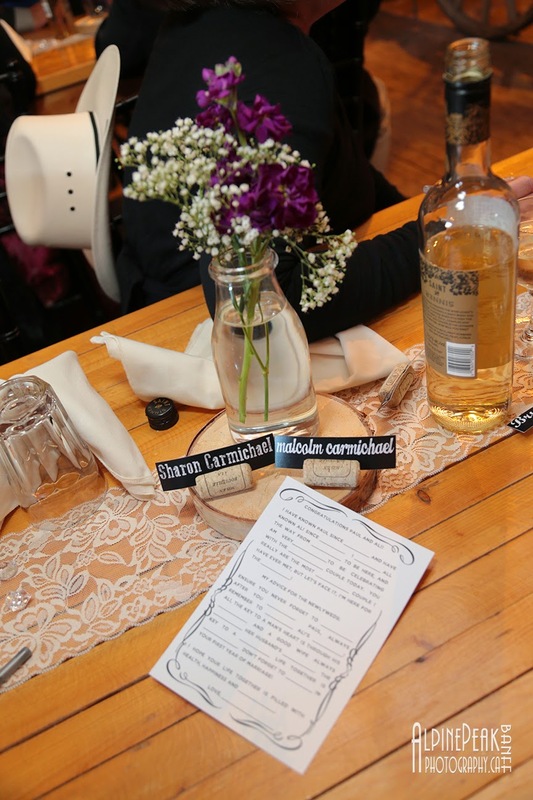 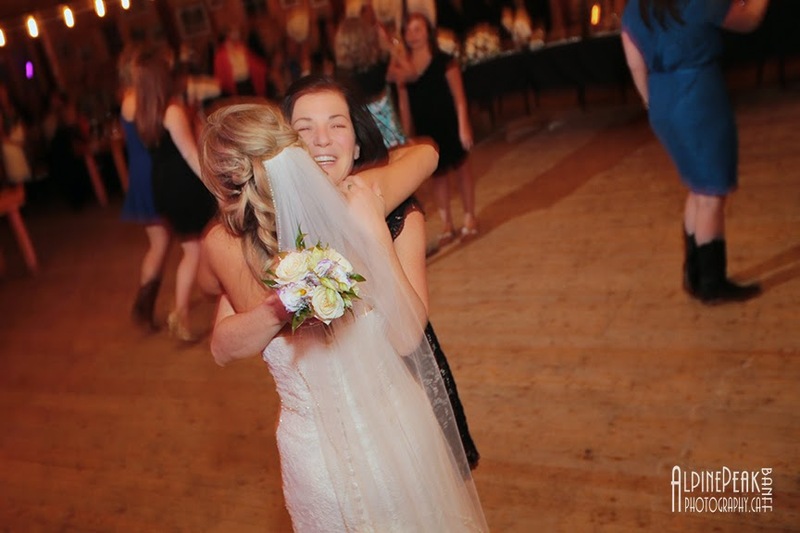 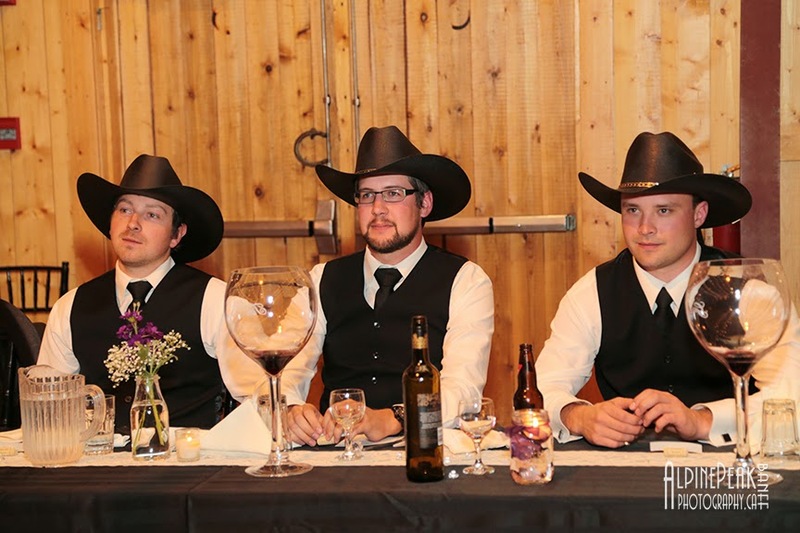 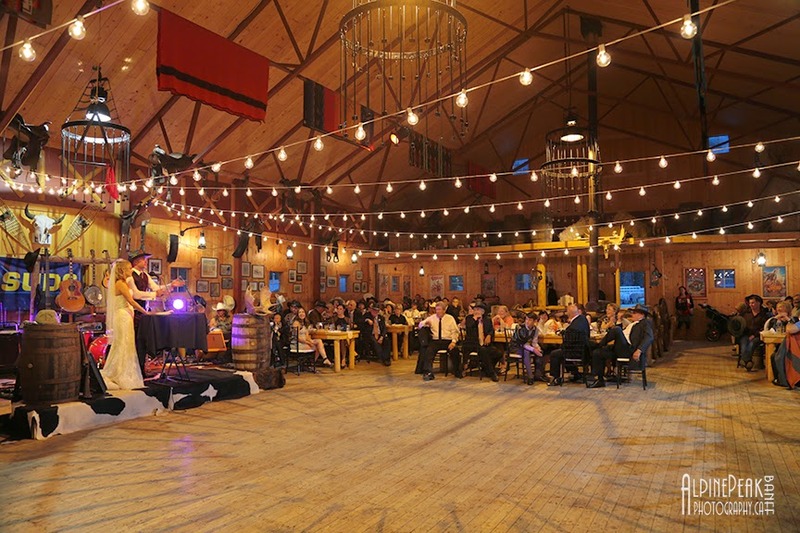 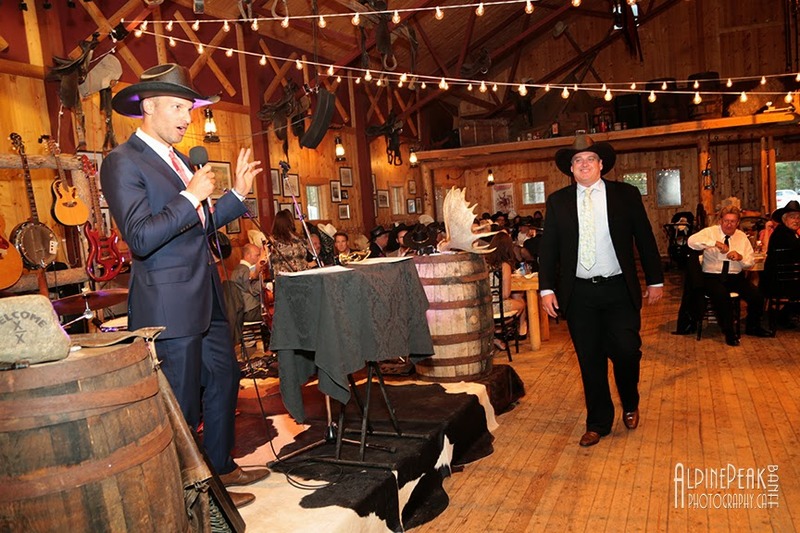 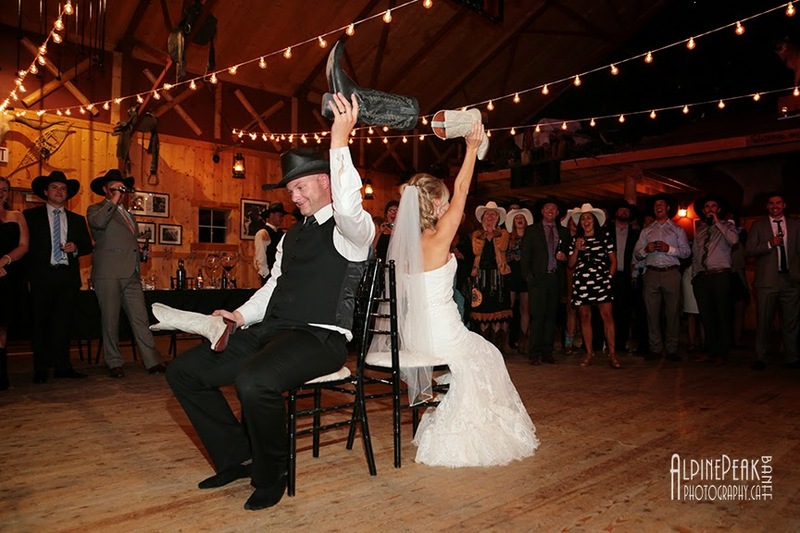 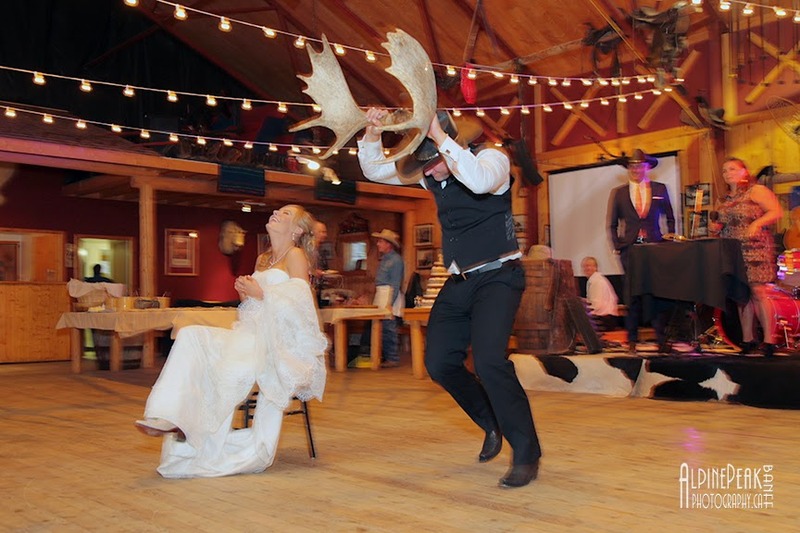 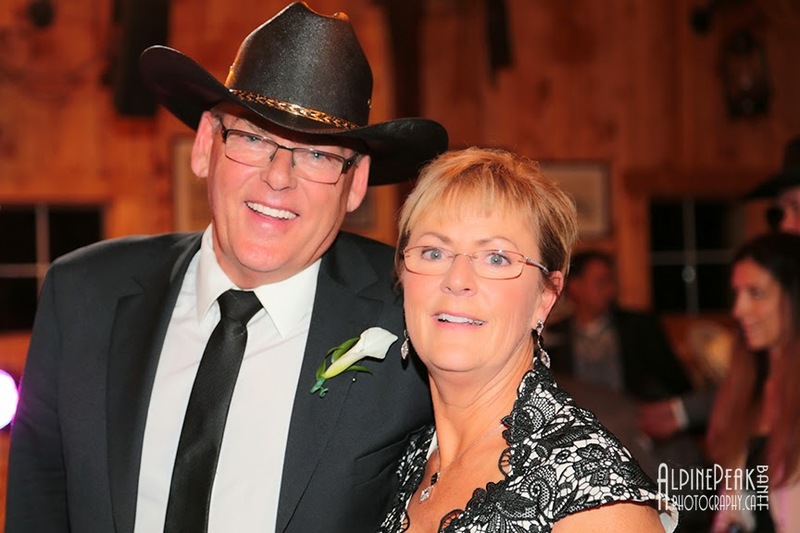 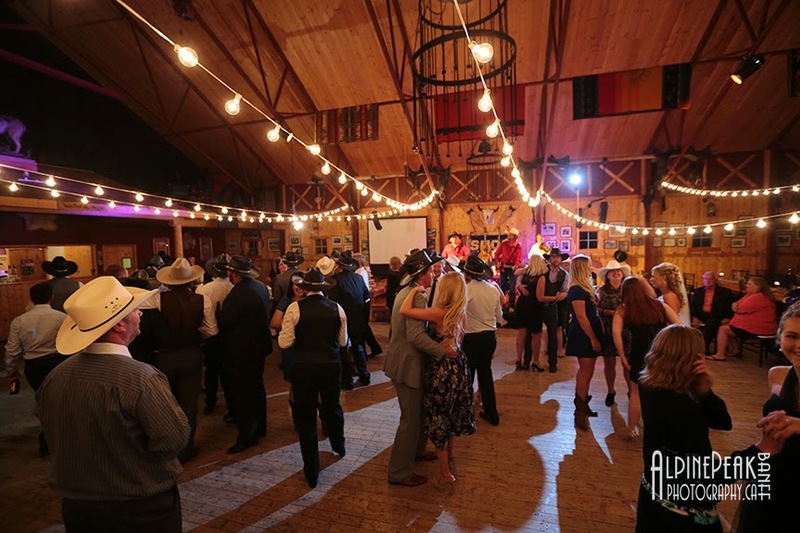 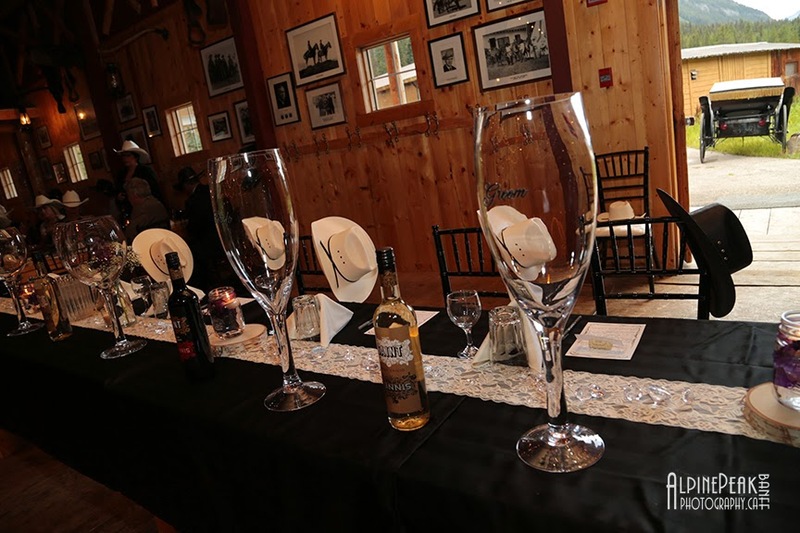 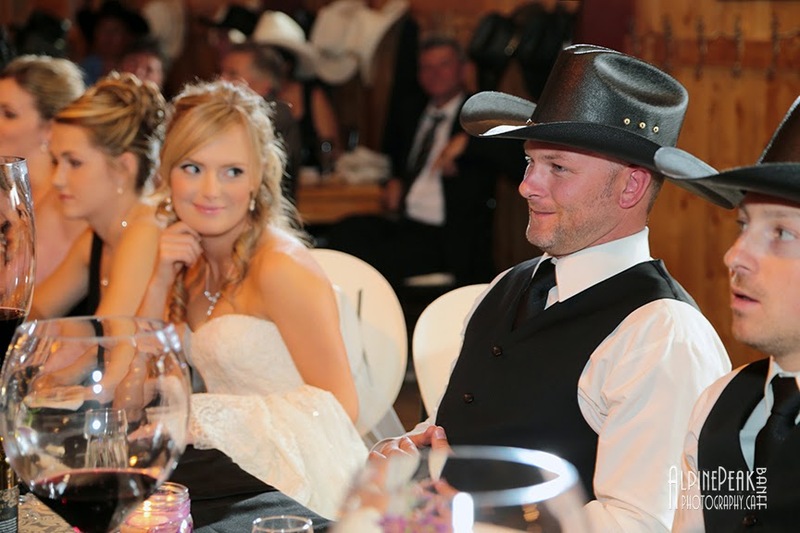 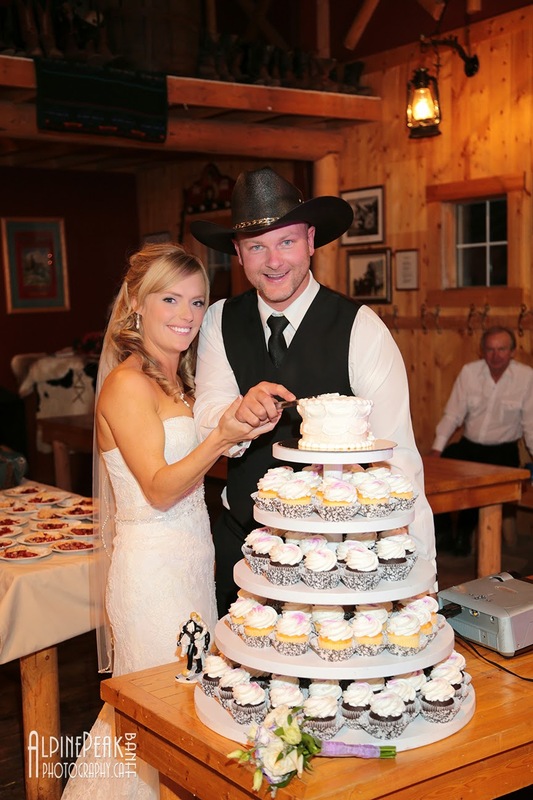 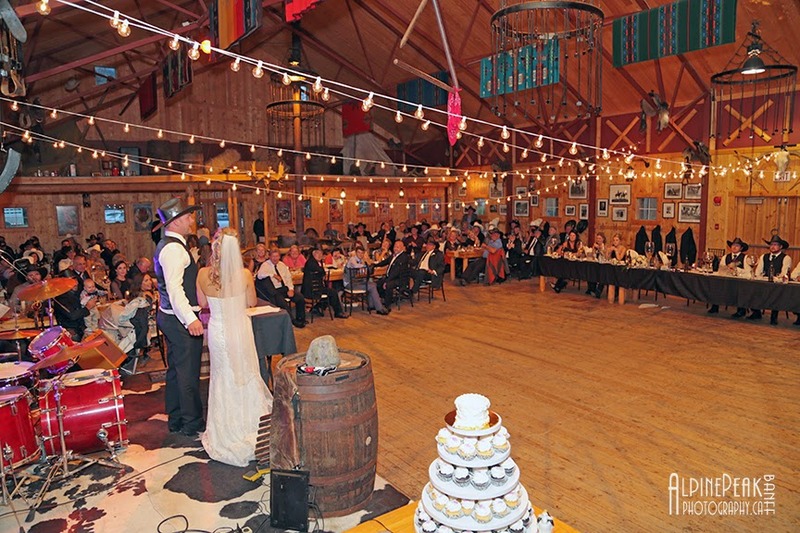 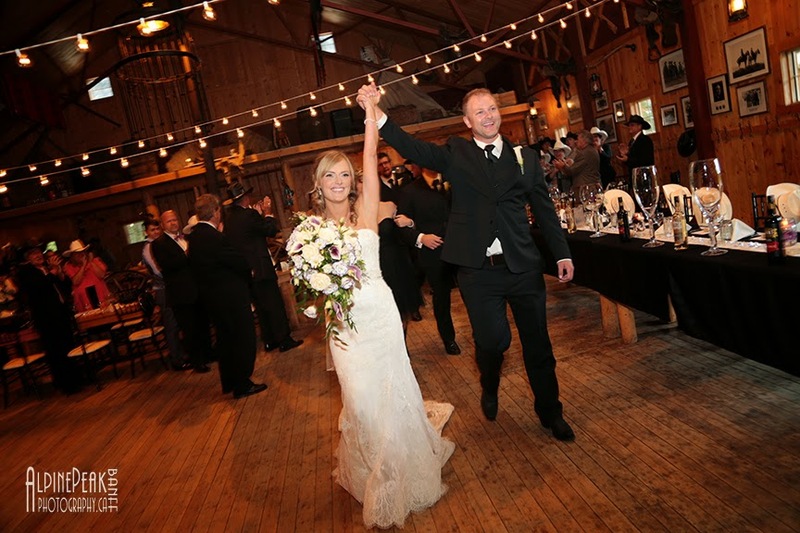 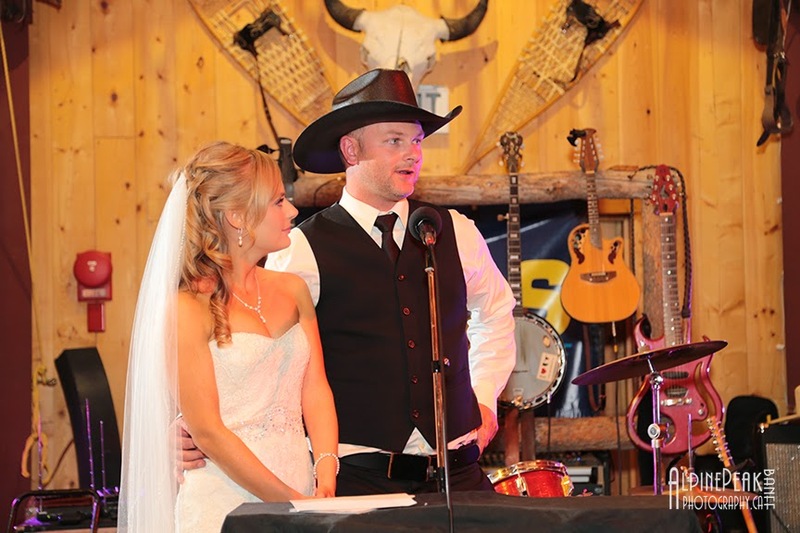 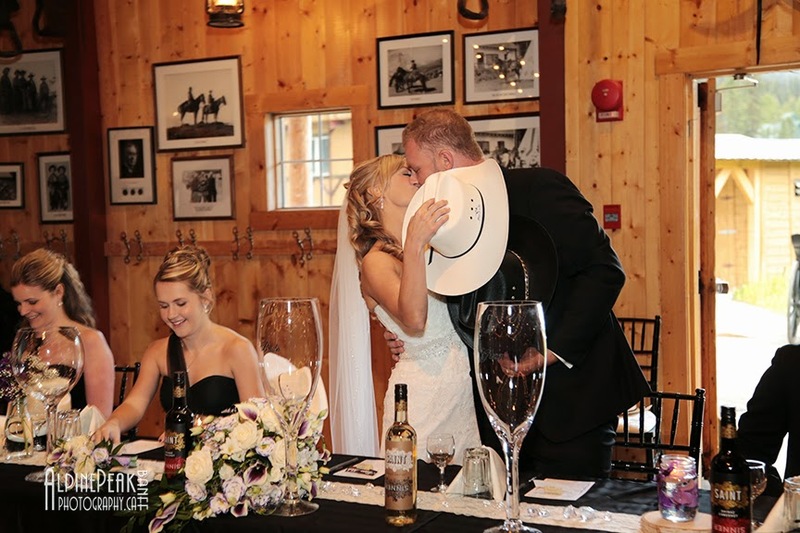 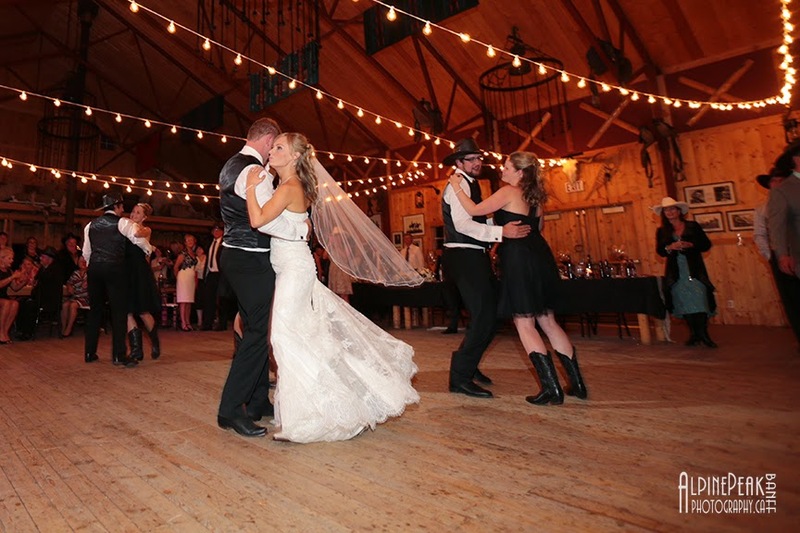 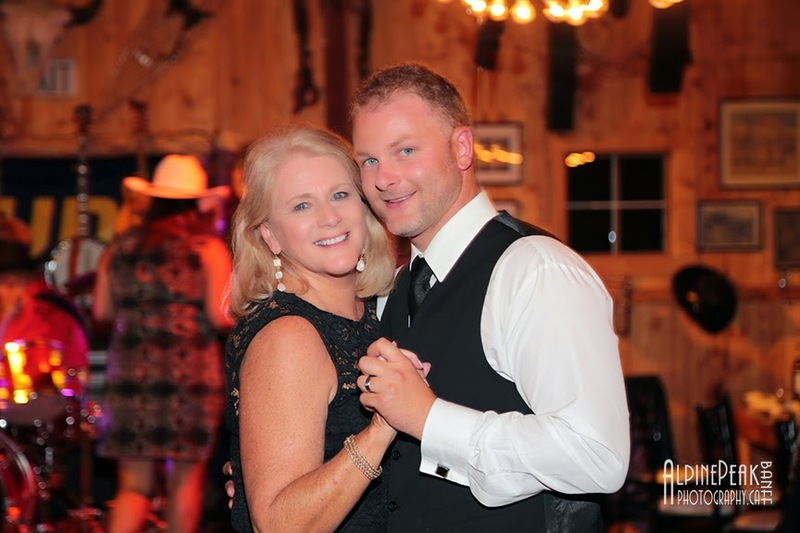 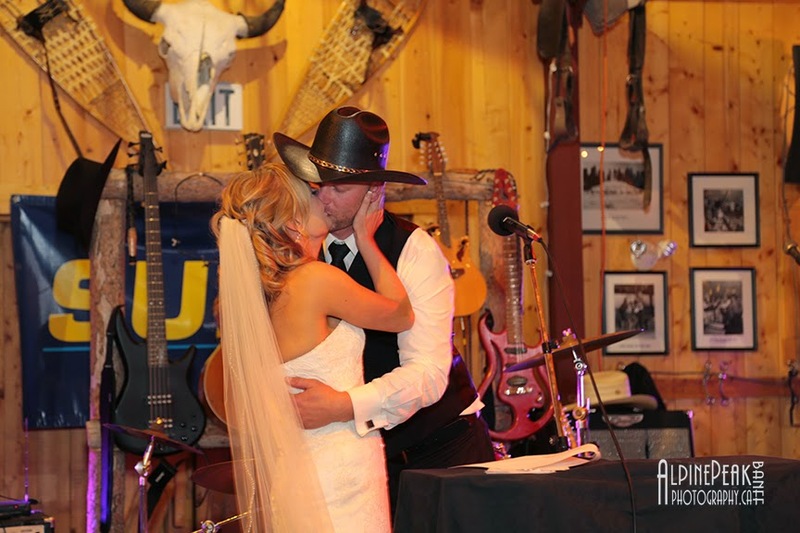 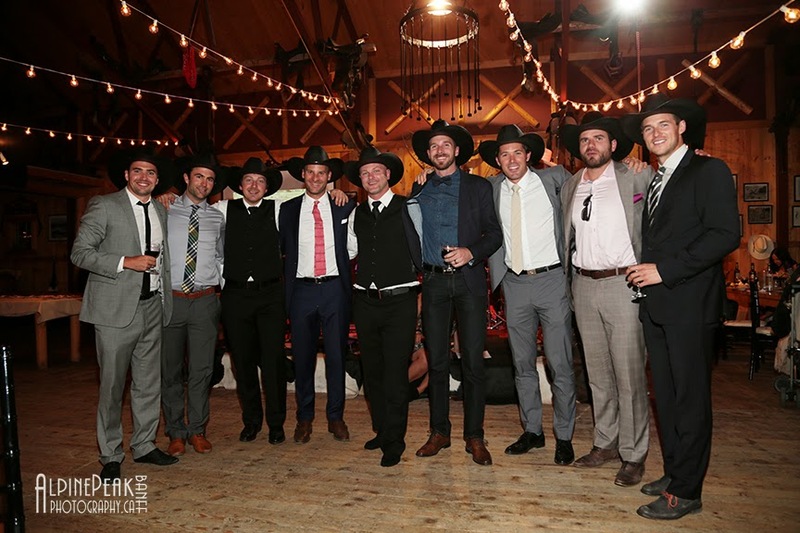 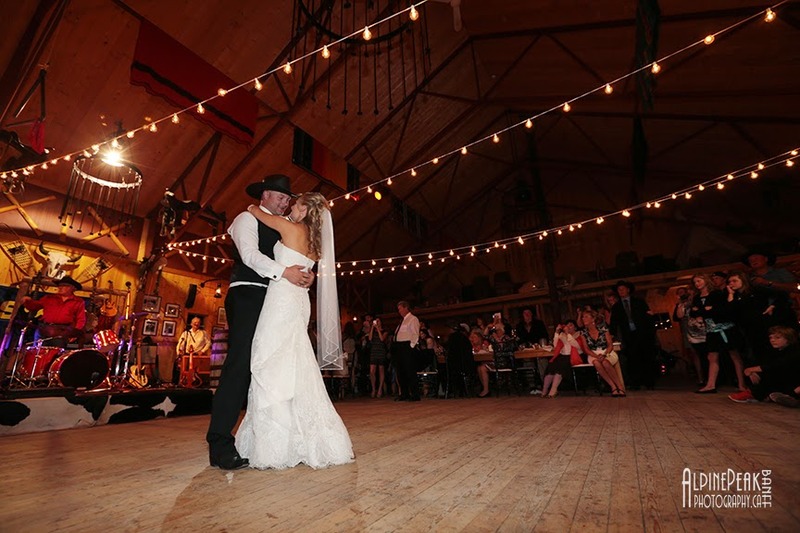 The Brewster Barn is the perfect place to hold a Western themed celebration. 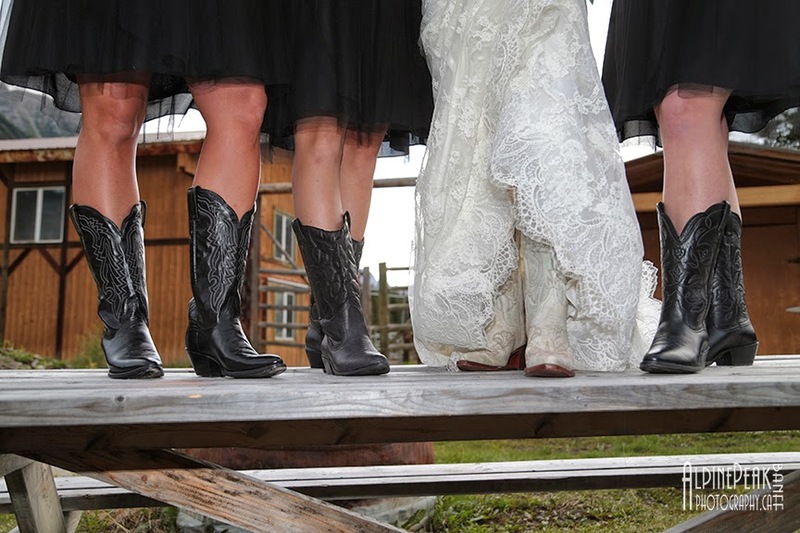 Love the cowboy boots, these ladies are ready to dance. 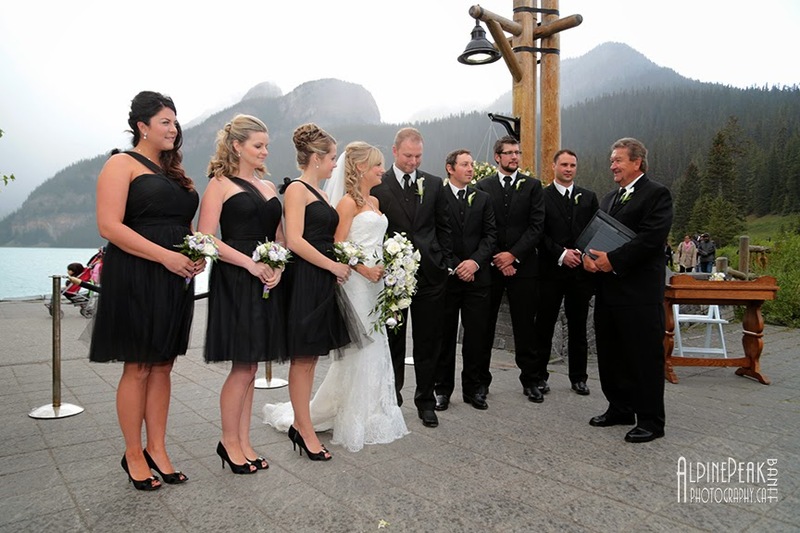 white for the ladies and black for the gentleman. 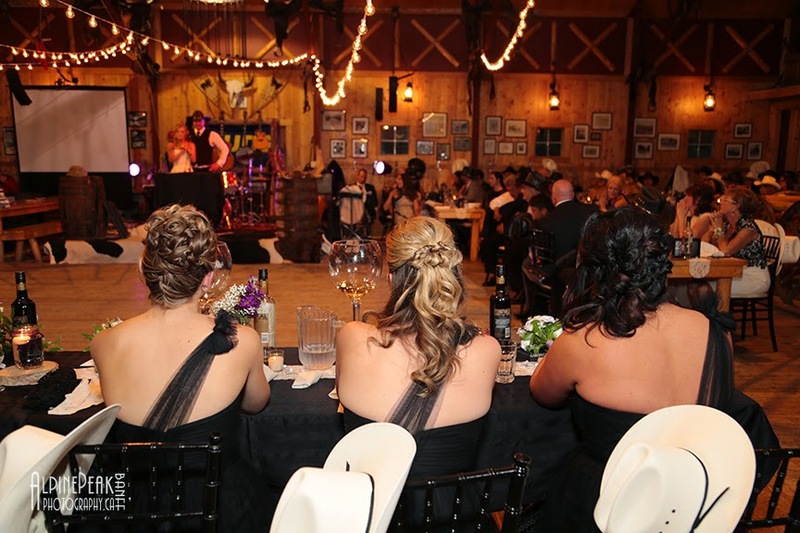 Everyone looked fabulous. 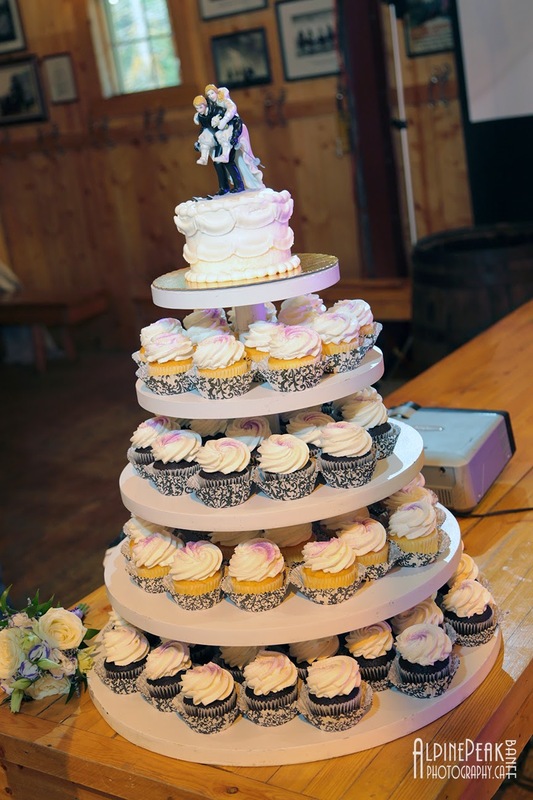 The simple and elegant decorations were perfect. 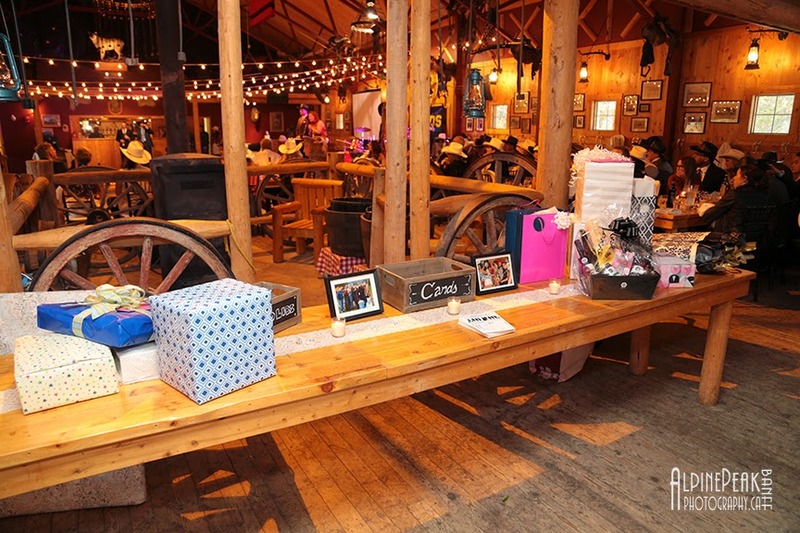 Day of Coordination, set up and tear down, was taken care of by Danielle and her team. 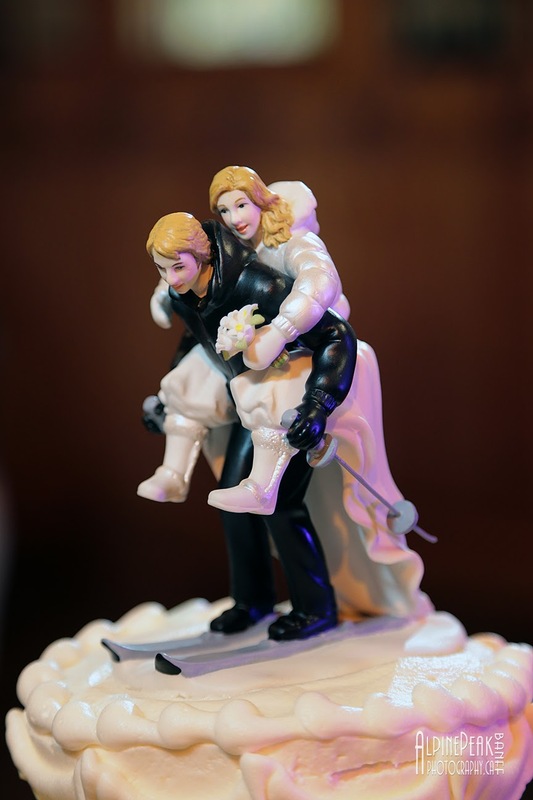 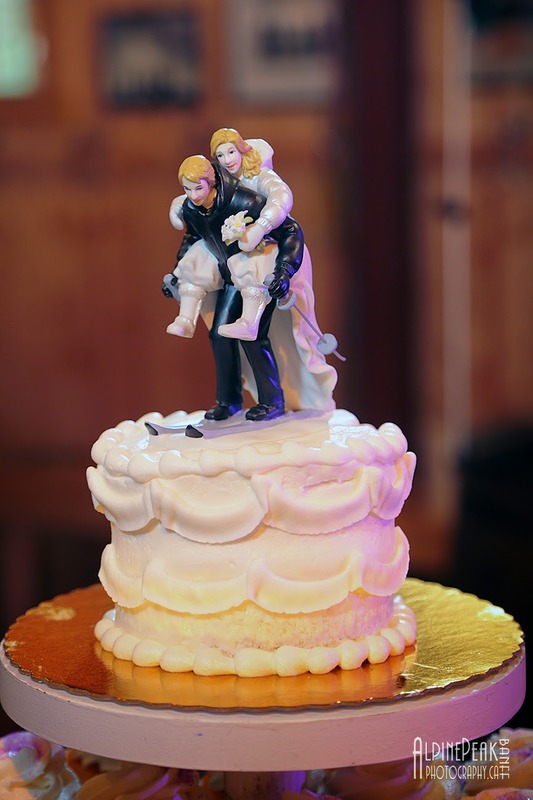 Very appropriate, the cake topper is a skiing groom carrying the bride. 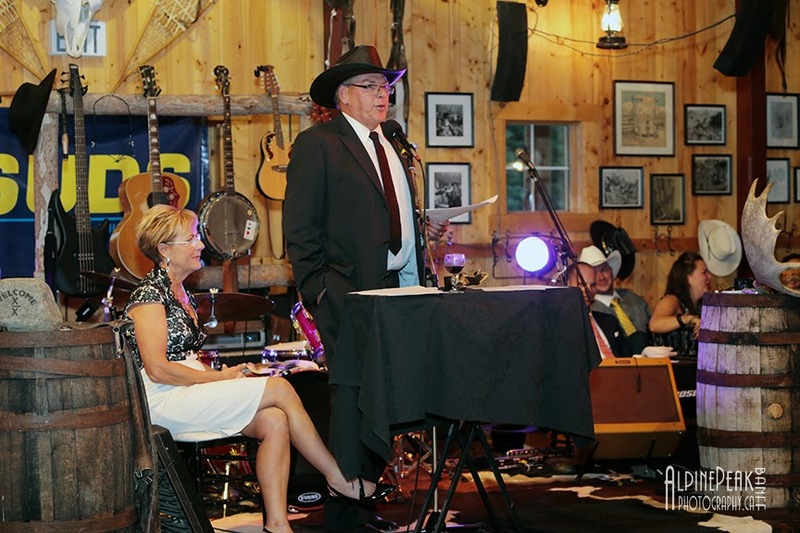 Both set of parents gave very entertaining speeches, we were all in stitches. 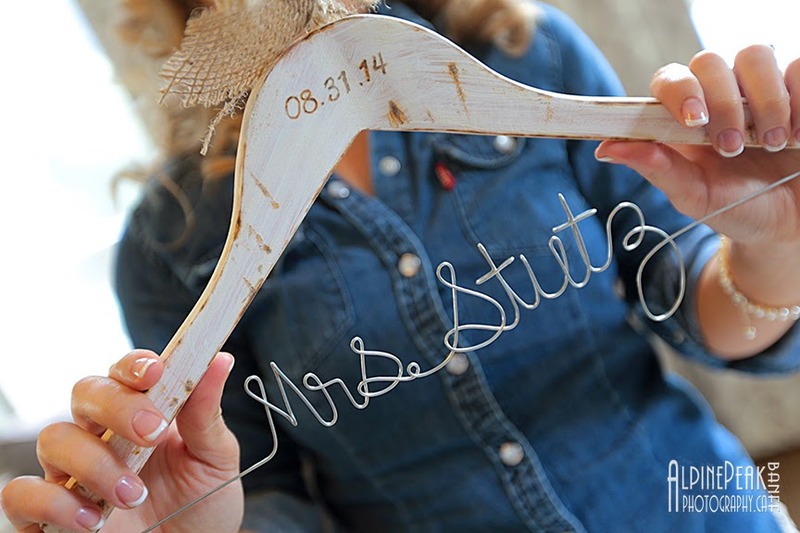 Pat gifted the bride a "Stutzy" t - shirt. 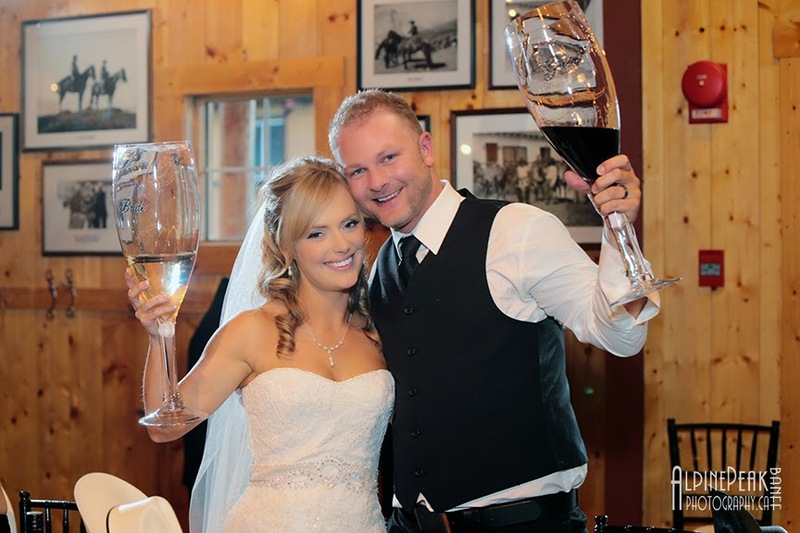 Now that is my kind of wine glass - Cheers! 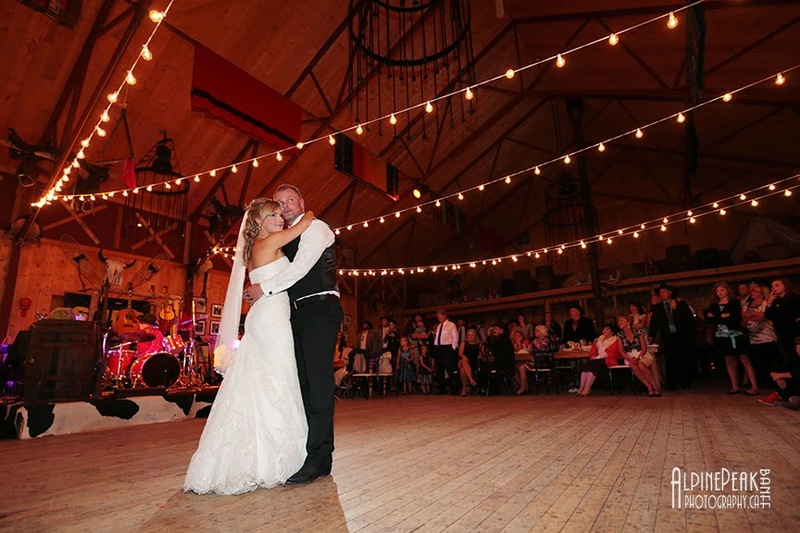 The ambiance of the barn, the lighting and set up was perfect. 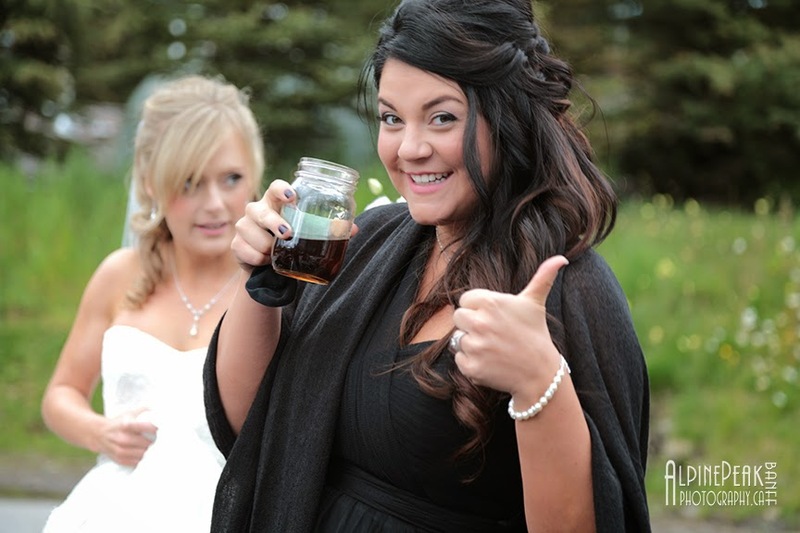 Casual & comfortable and lots of FUN. 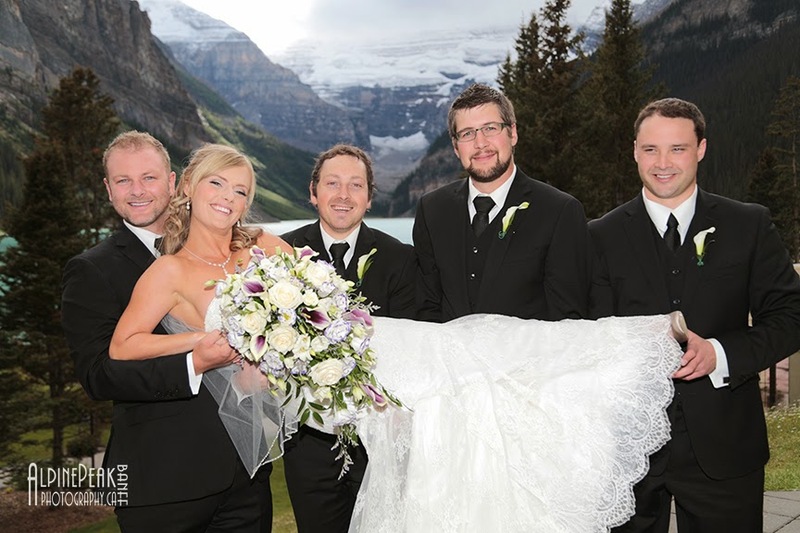 so you may recognise a few ski faces here. 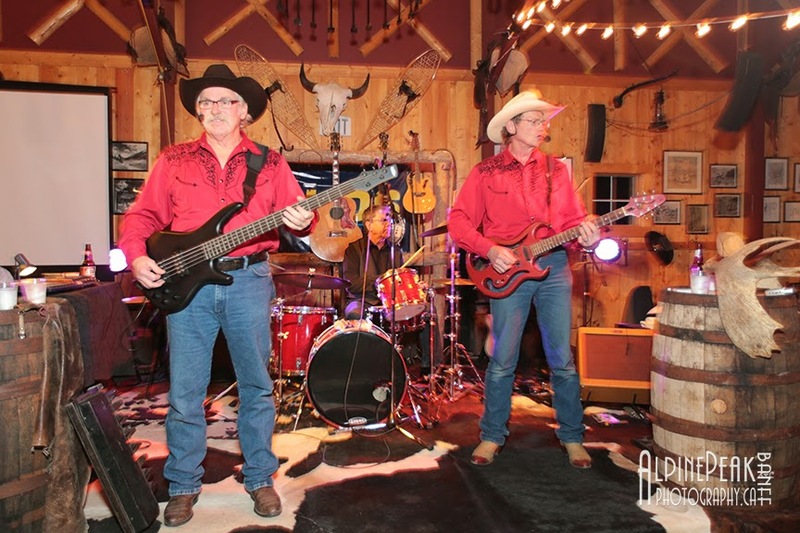 The Suds - Larry & Gary got everyone dancing. 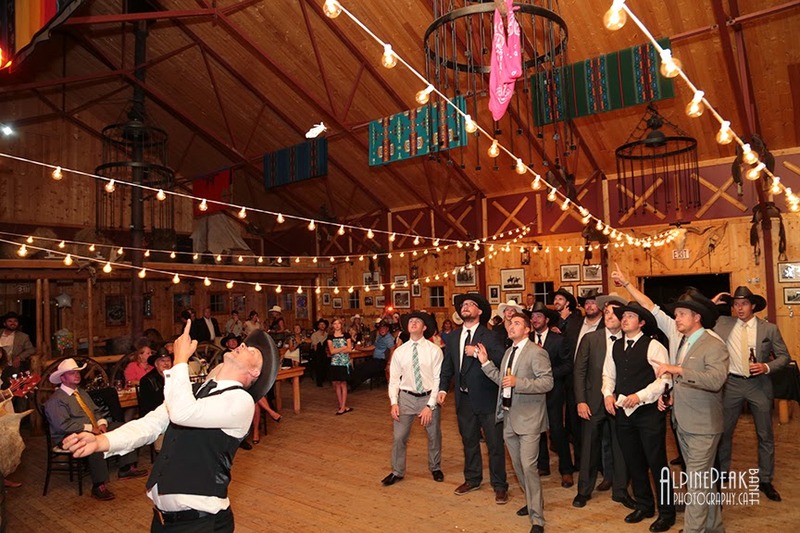 Who is going to catch the garter?